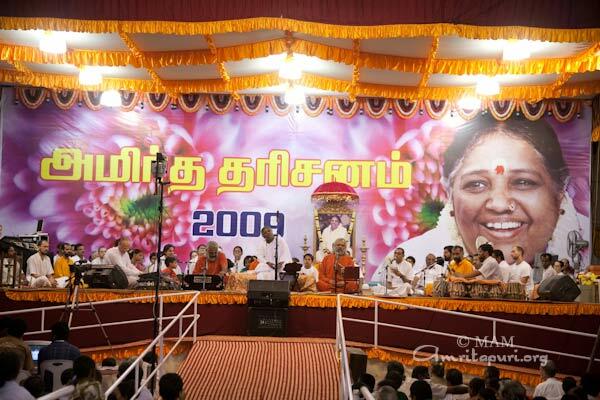 15 -17 Jan, Bharata Yatra 2009, Enroute to Kovai & Brahmasthanam festival. 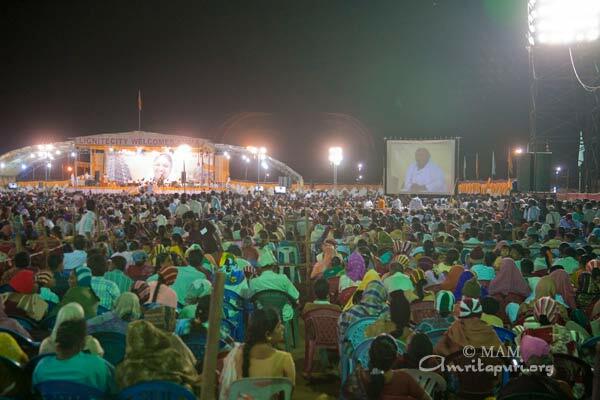 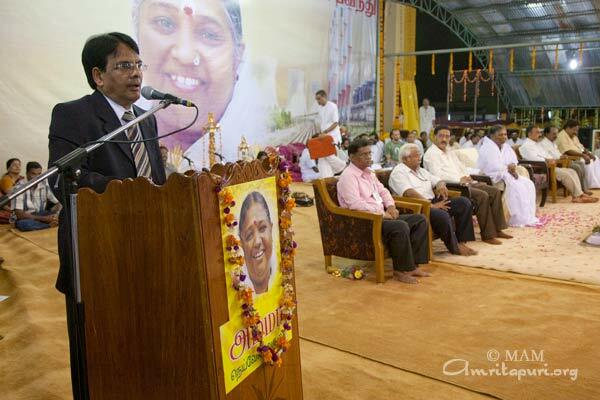 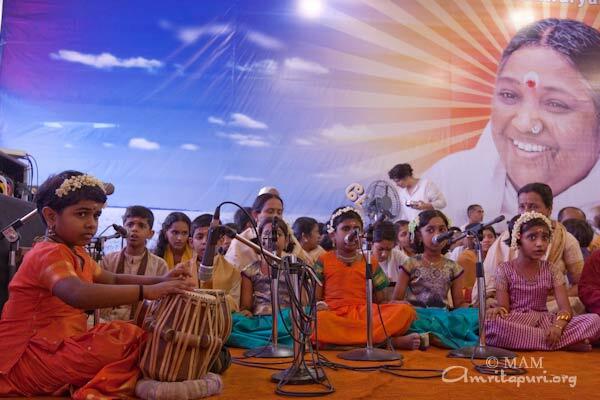 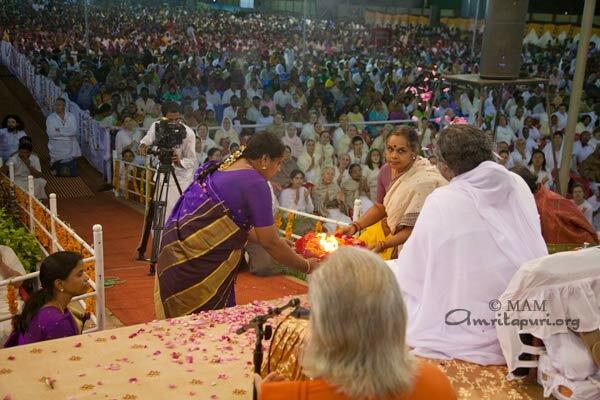 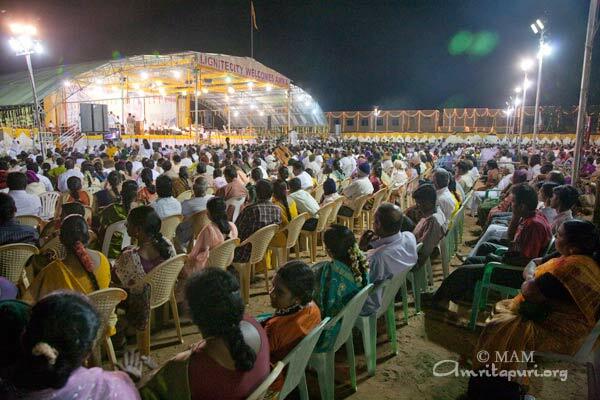 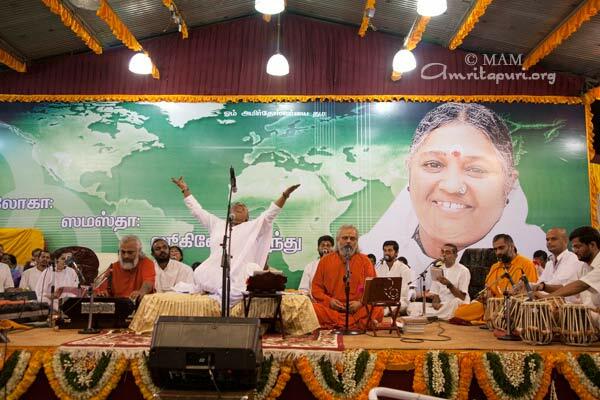 Photos from Amma’s visit to Amrita University, meditation, satsang & bhajans by the swimming pool, Kovai Brahmasthanam festival and celebration photos. 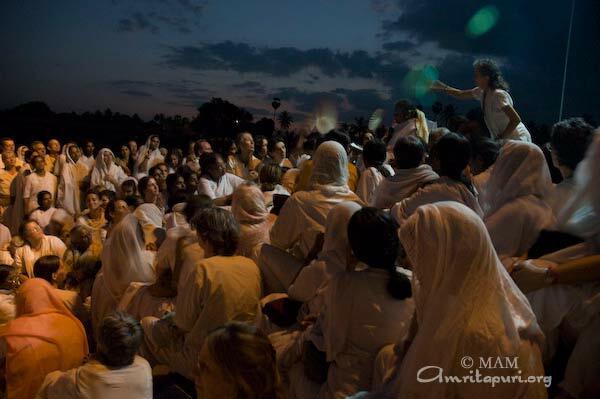 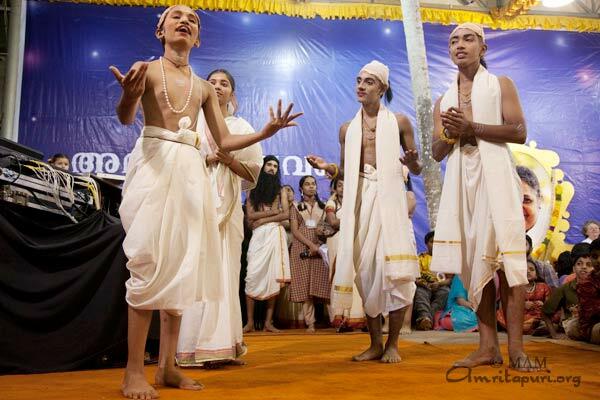 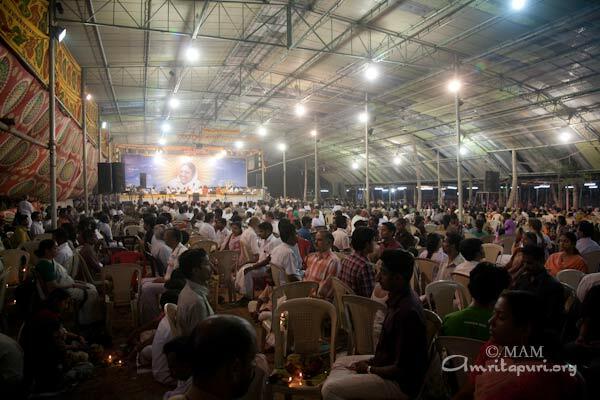 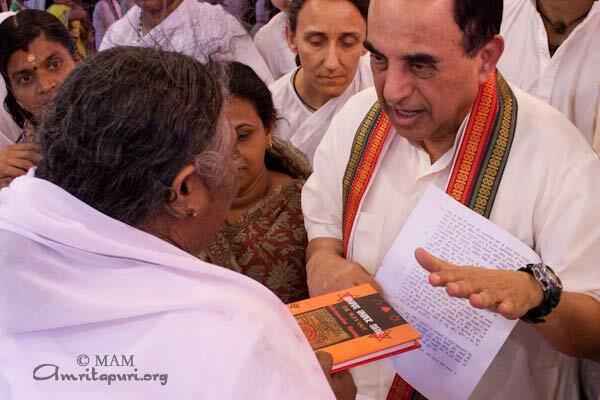 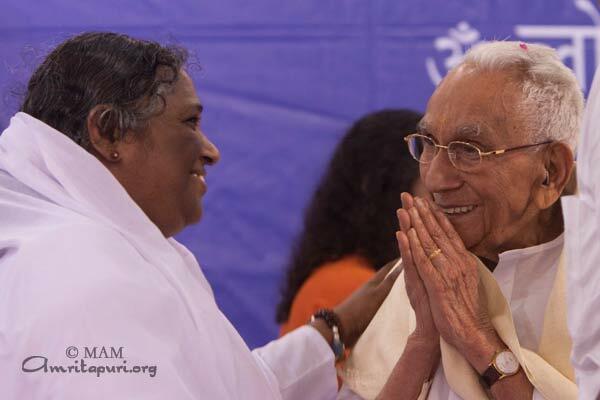 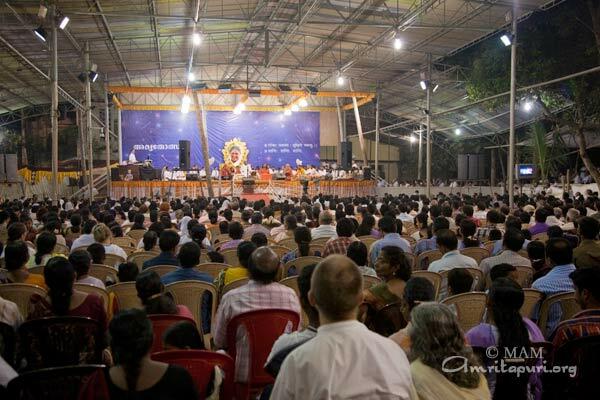 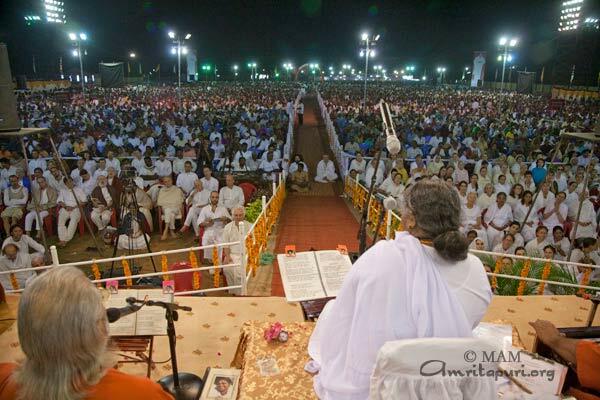 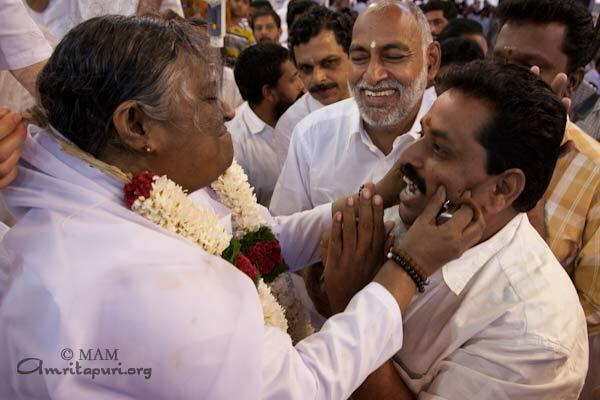 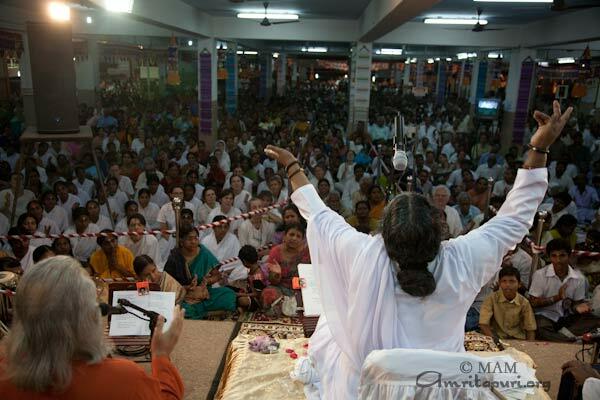 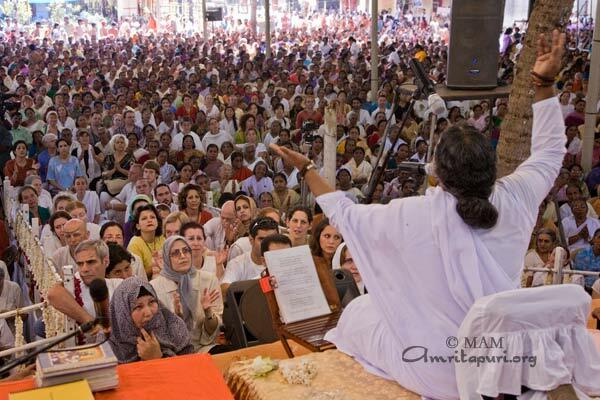 The ashram recently purchased some land at Thodiyoor – about 30 km away from Amritapuri. 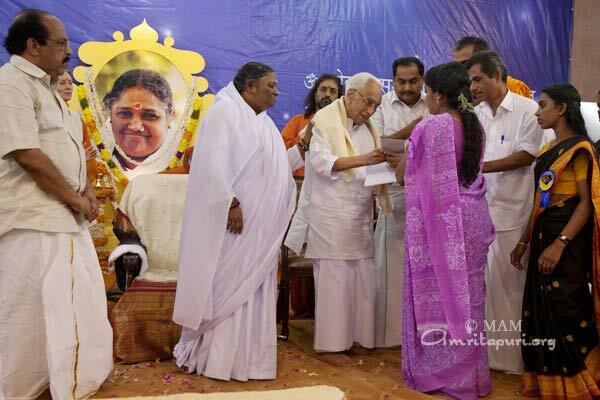 Amma had advised to start agriculture there. 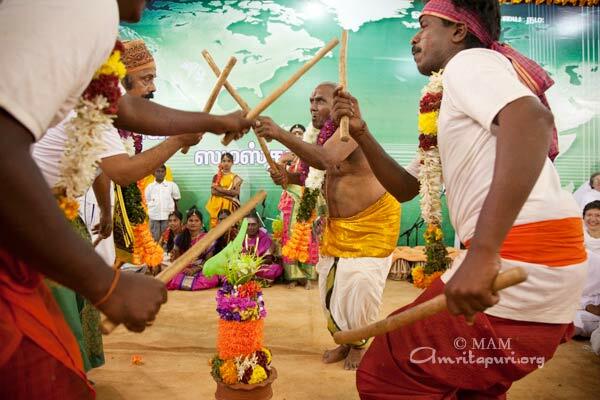 A few days ago, after the harvest, the first bundles of cut stalk from the fields were brought to Amritapuri. 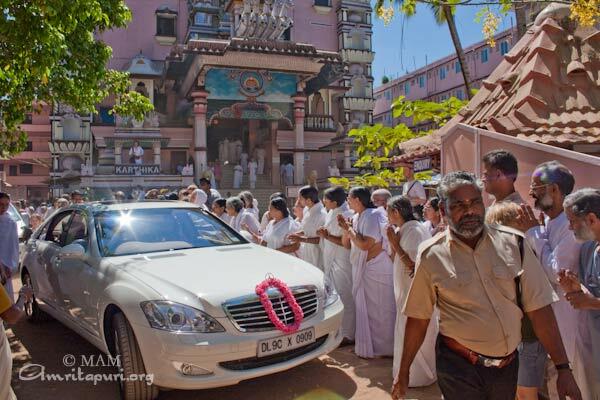 The last couple of days have seen a continuous process of rice threshing by the Ashram residents. 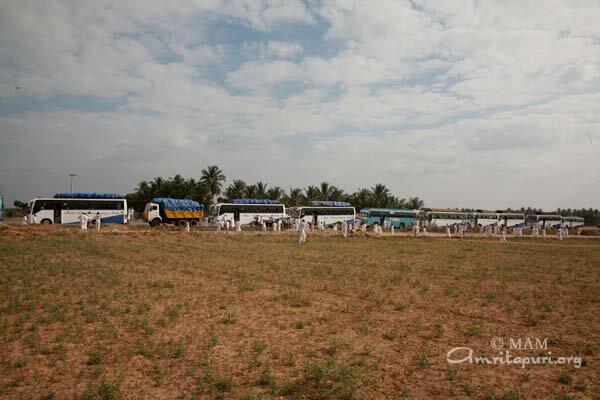 Though most of the residents have no prior experience in agriculture, everyone was infused by the enthusiasm and they learnt the trade really quickly. 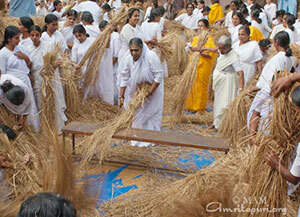 First the hay had to be threshed to remove the grains – by beating the stalks on a hard surface. 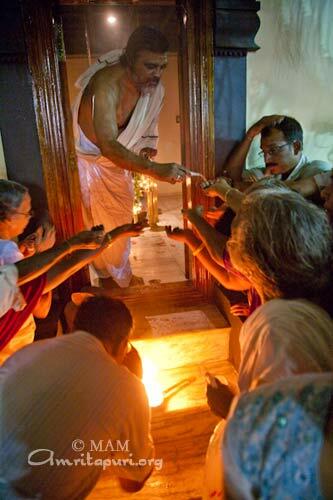 In some places they thresh it with the feet. 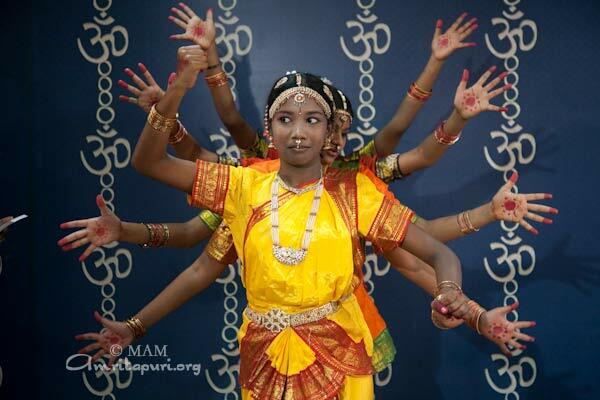 Here it was done solely by the hands. 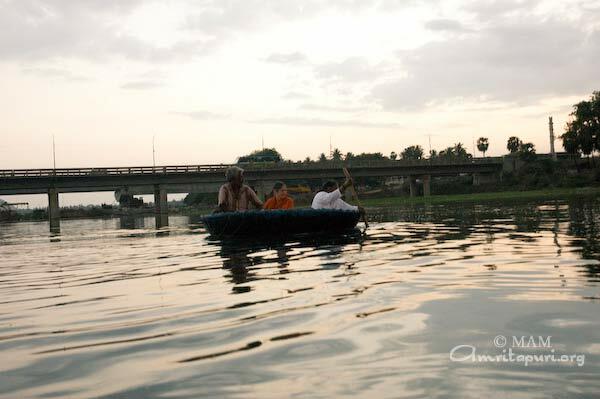 And it was all the more fun for it. 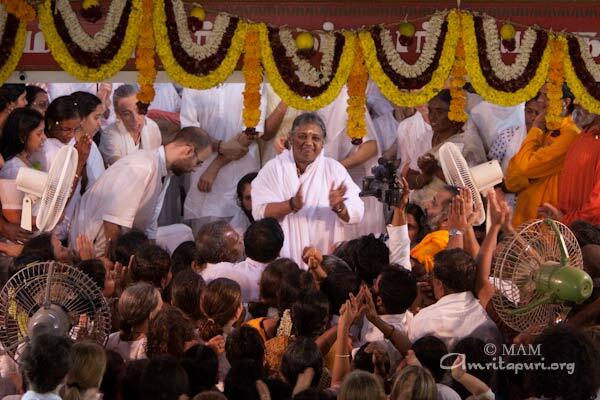 Thereafter the grains have to be winnowed to remove the grains from the chaff. 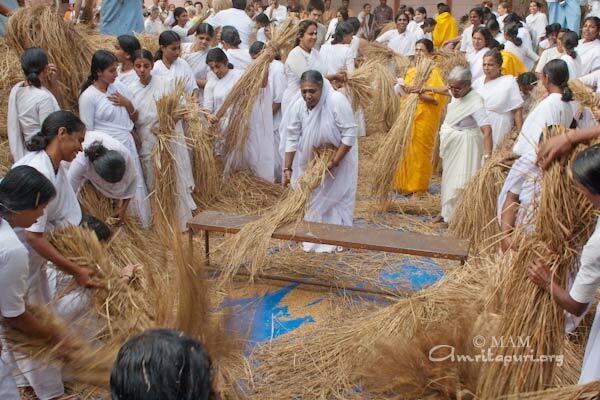 The grains are slowly dropped from a height – and a fan blows air as it falls – carrying away the chaff along with it – and the heavier grain falls on to the ground. 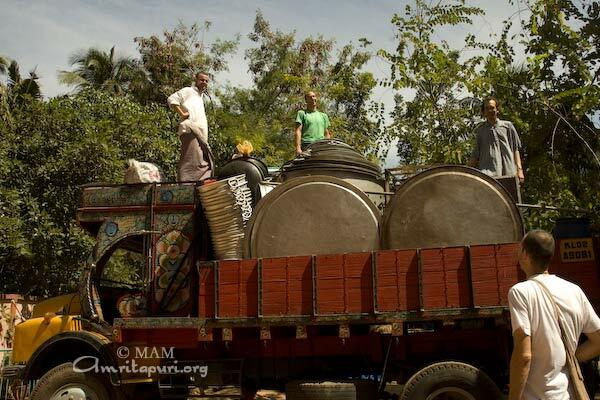 The grain is then collected. 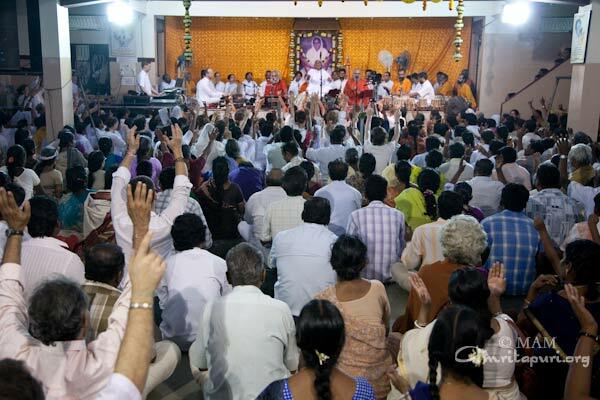 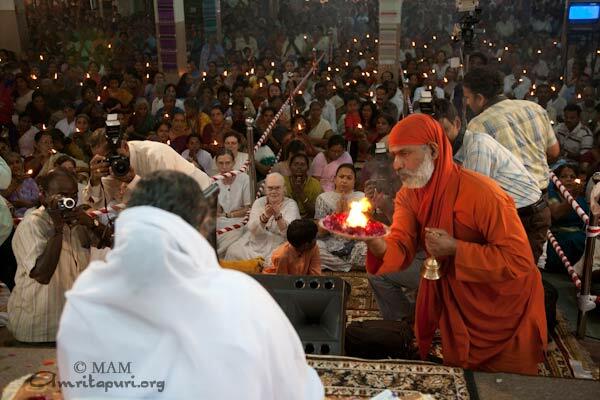 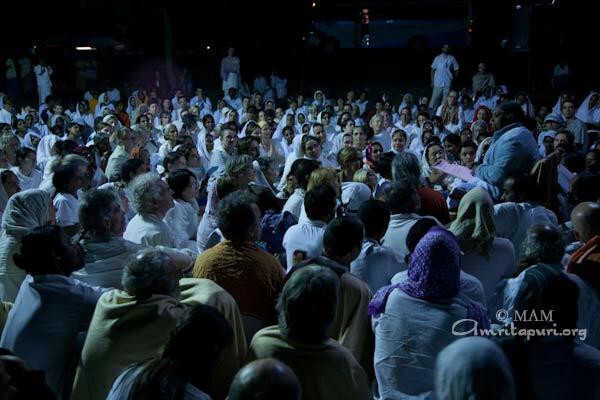 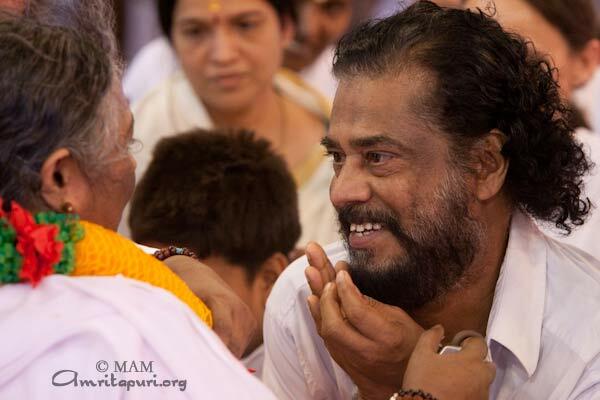 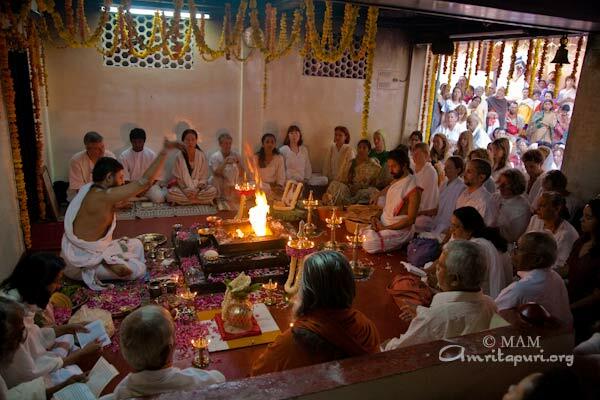 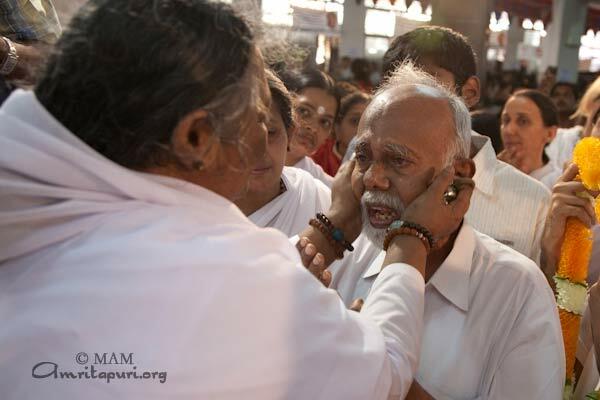 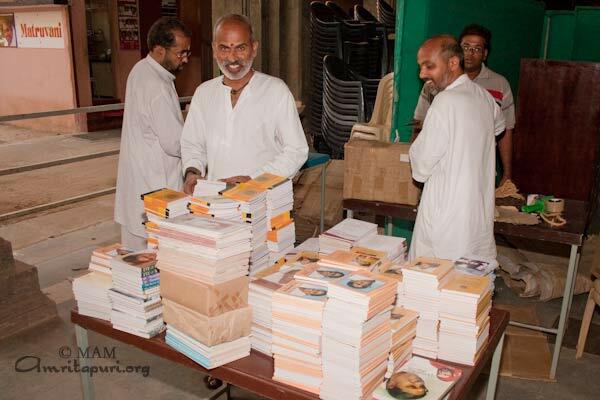 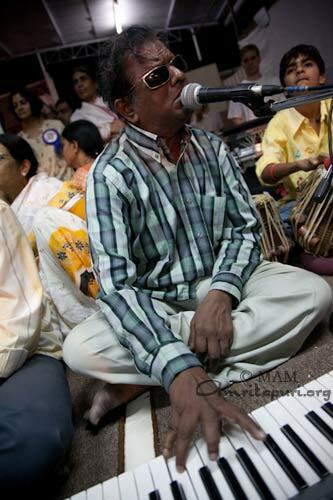 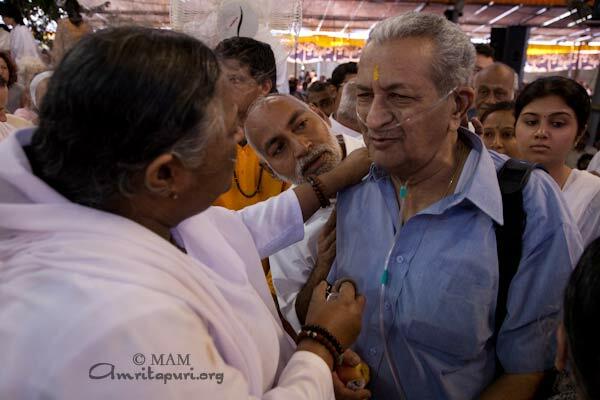 This whole process was being accomplished by the ashram residents and visitors. 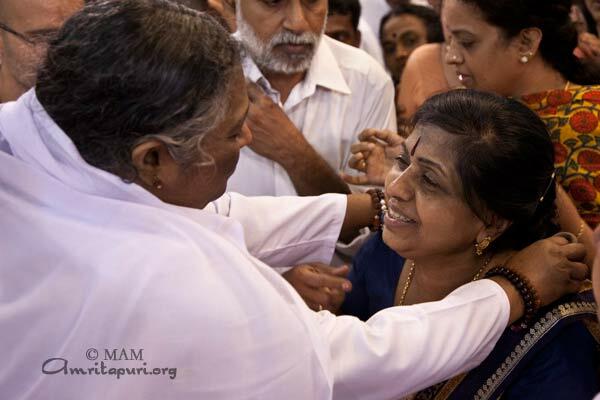 Yesterday, Amma joined in. 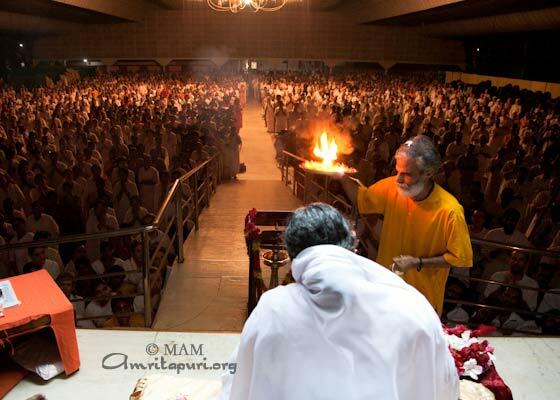 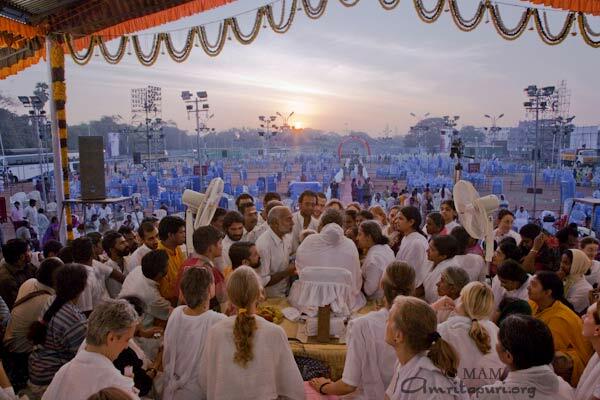 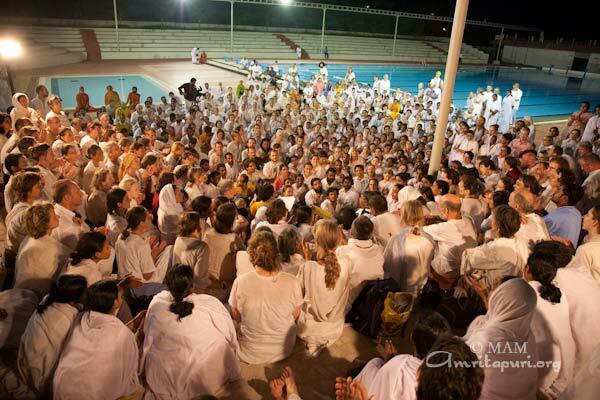 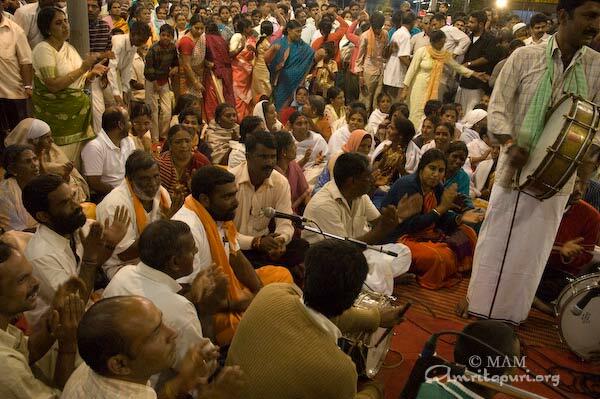 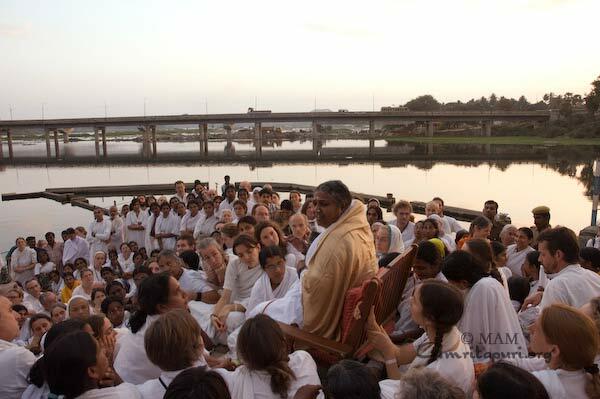 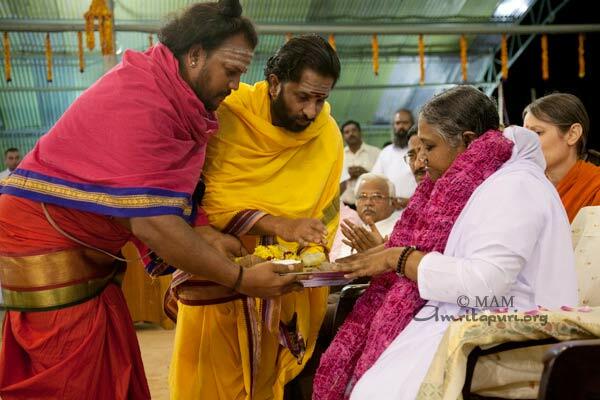 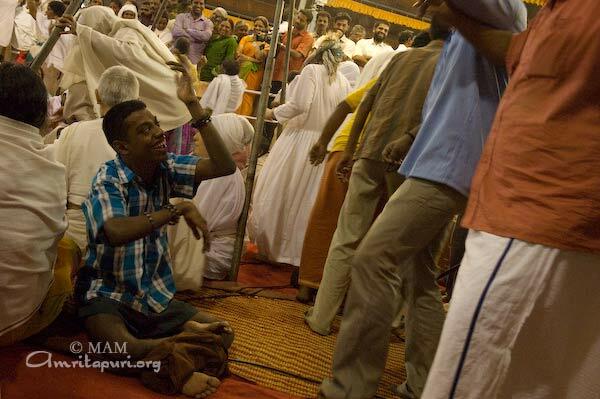 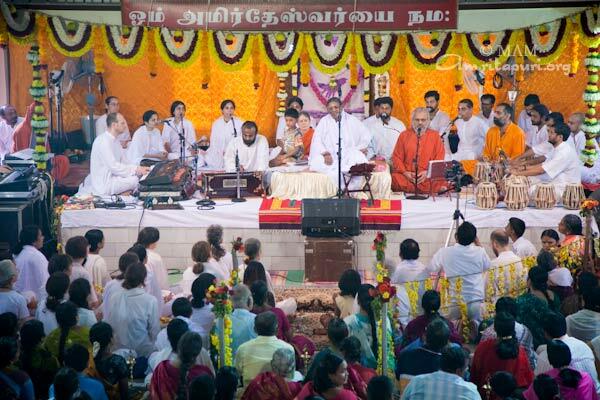 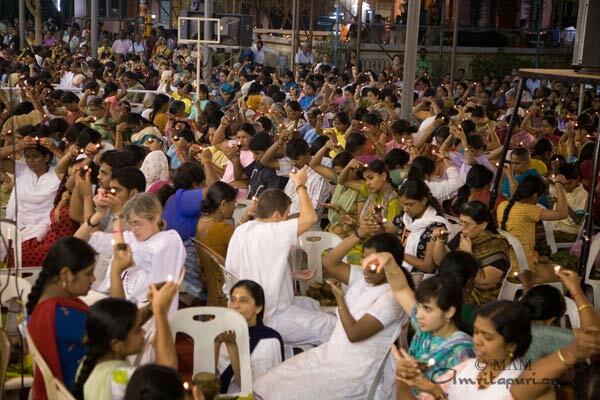 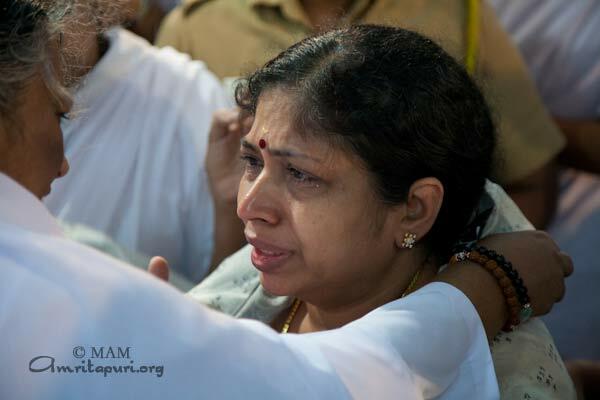 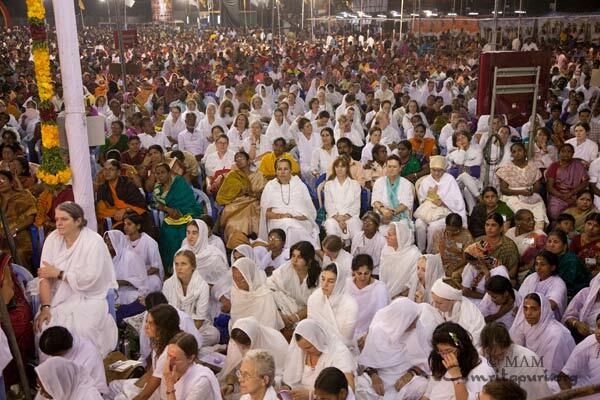 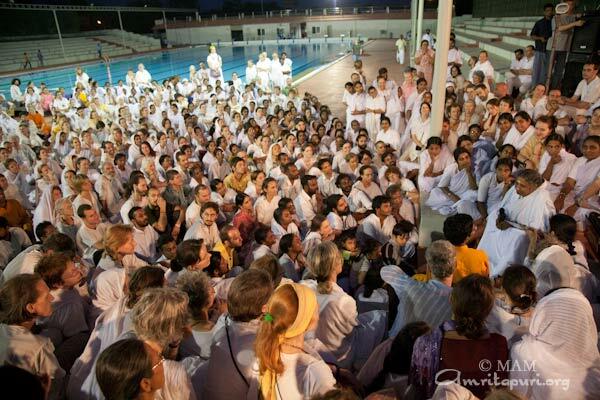 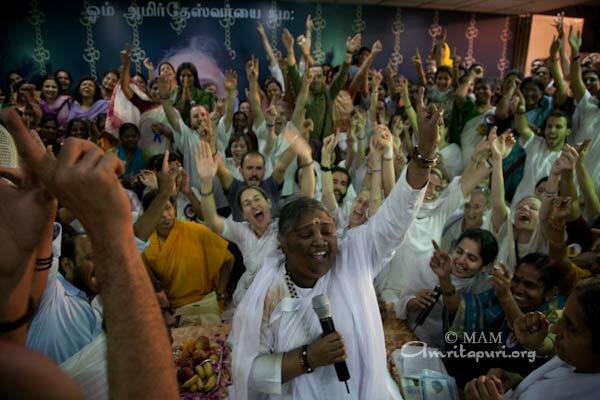 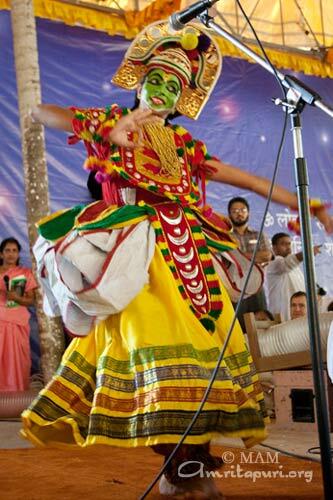 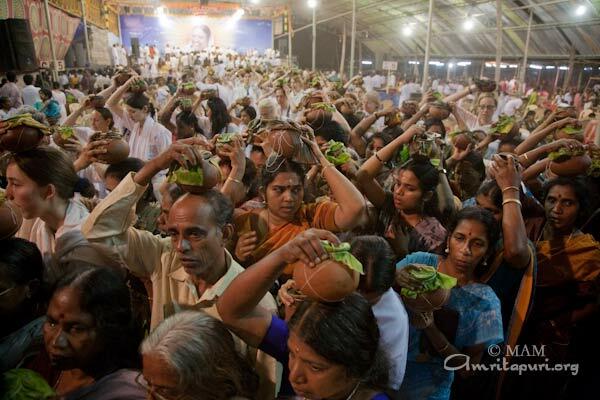 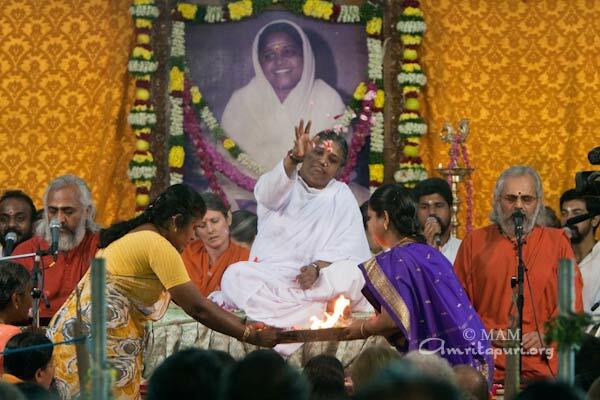 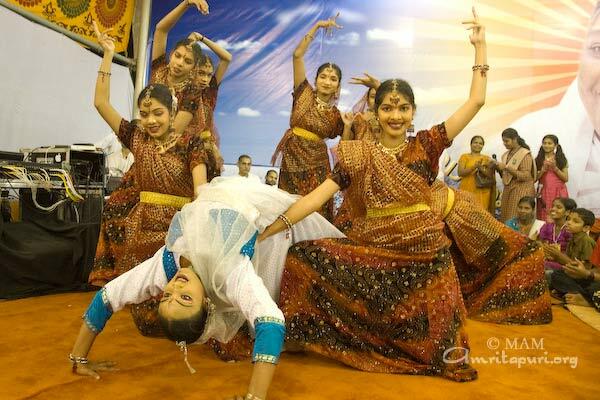 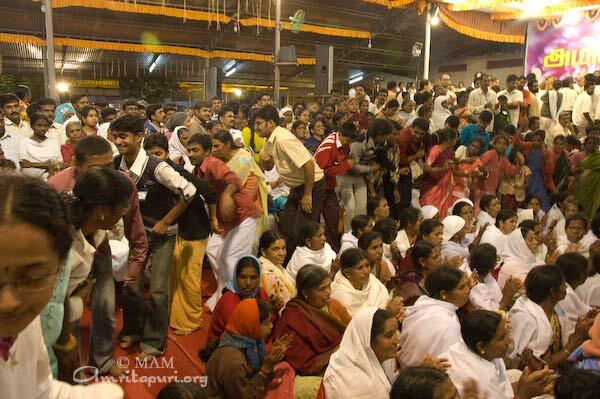 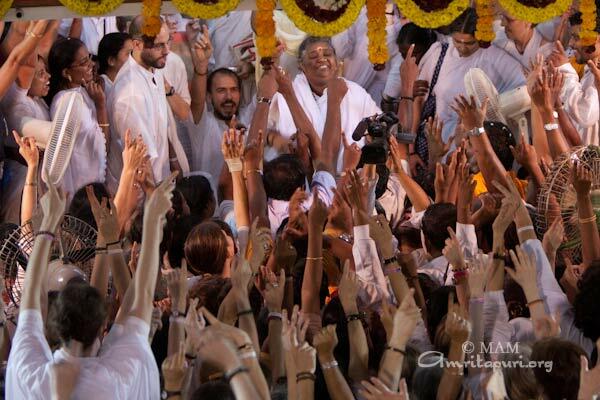 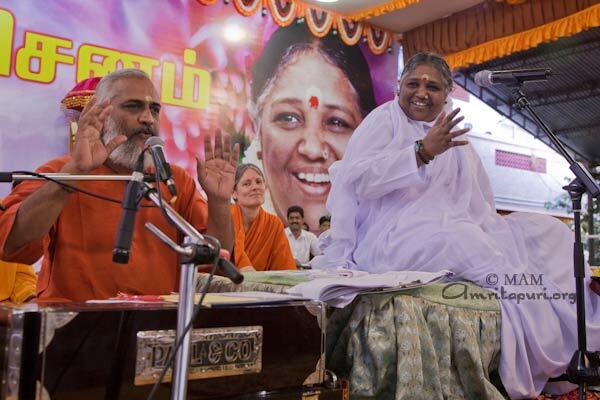 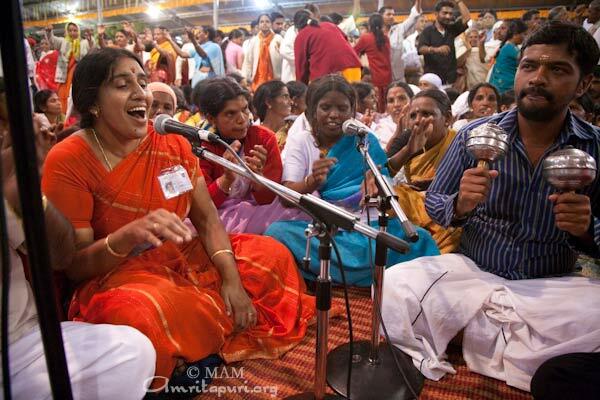 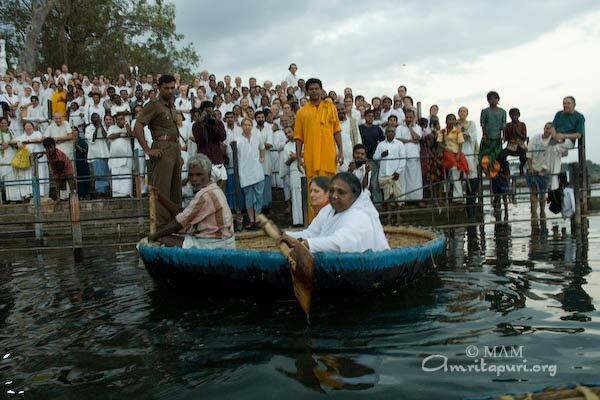 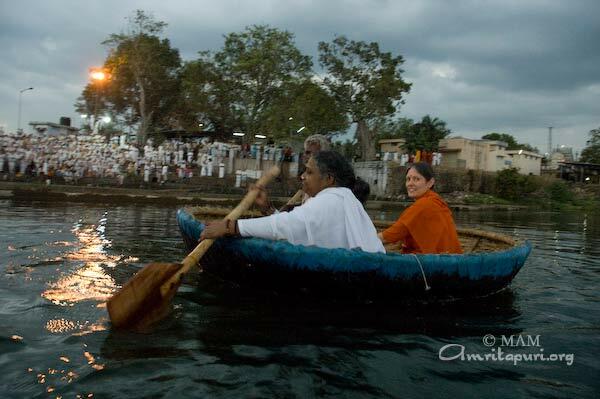 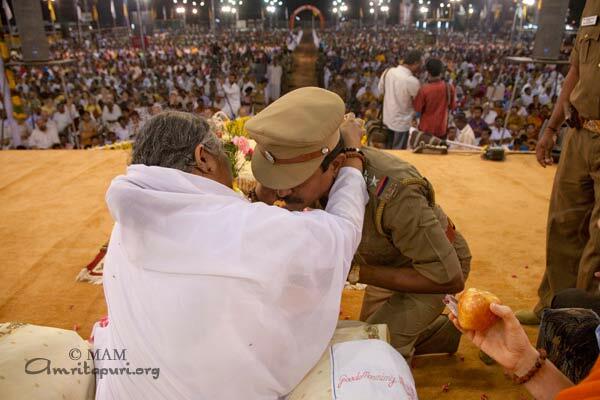 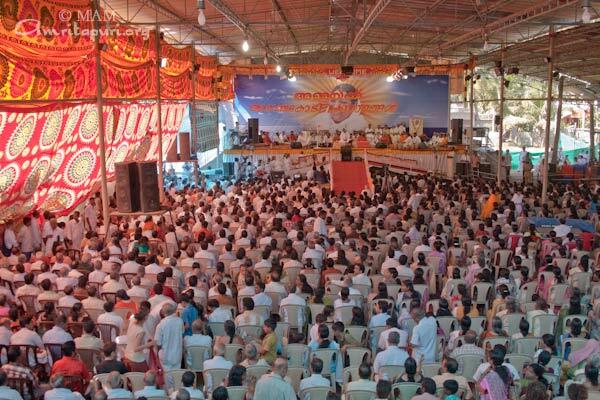 And when Amma leads in seva – it has to be seen to be believed. 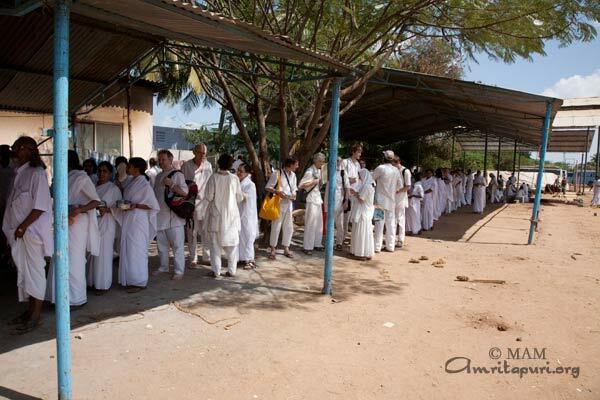 Brahmacharis, Brahmacharinis, college students, ashram residents, devotees and visitors to the ashram – everyone wanted to do something. 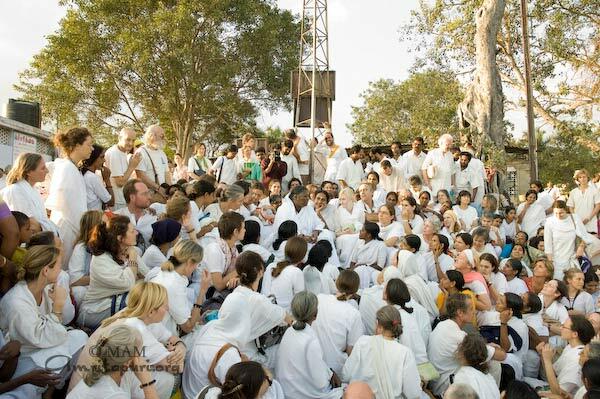 As everyone scampered to get their hands on a bundle of hay – the huge pile simply disappeared in no time. 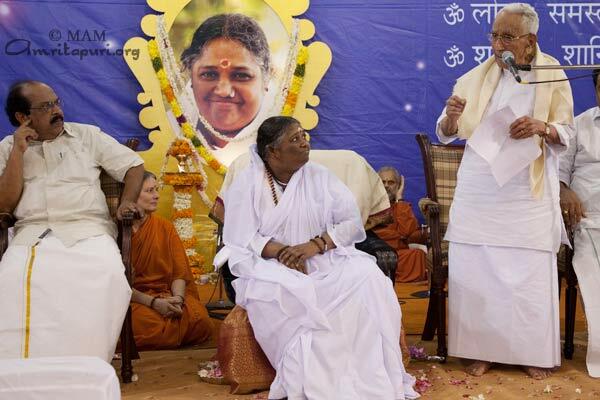 It looked like a big festival with everyone happily flailing away their respective bundles. 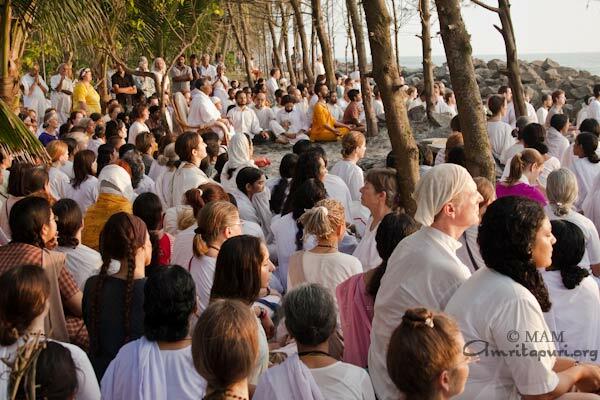 What would have otherwise taken about 2 days to finish, was accomplished in one and a half hours – and everyone was in an uplifted state by the time they finished. 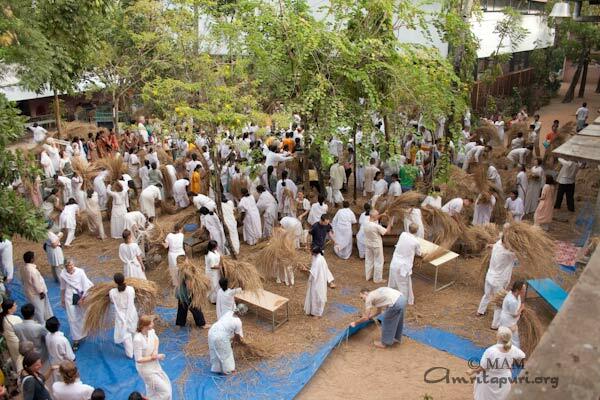 Everyone was joyfully involved in what would otherwise seem like a dry chore. 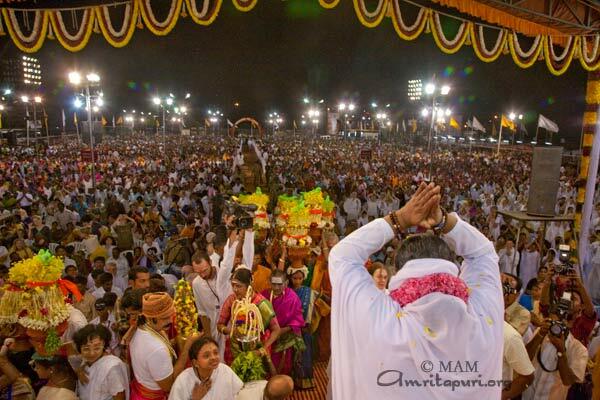 Work done, everyone happy and Amma satisfied. 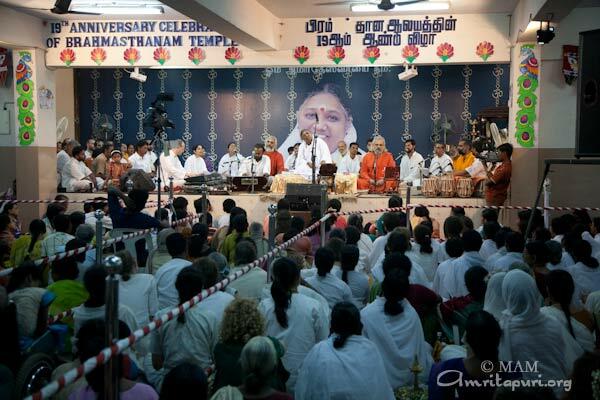 The students, who had been actively involved, gathered around Amma and asked her about the significance of the harvest and the meaning of their endeavour. 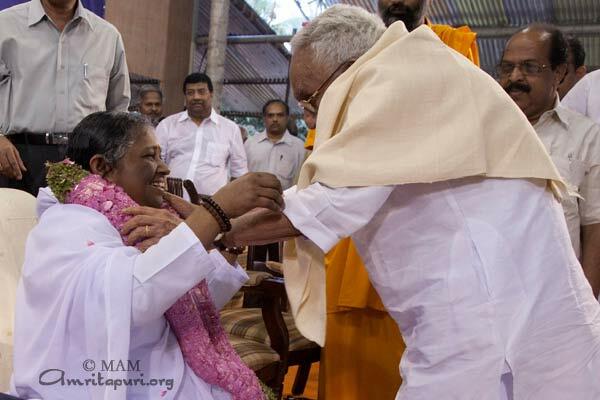 Amma replied that in the state of Kerala the culture of cultivating land is vanishing. 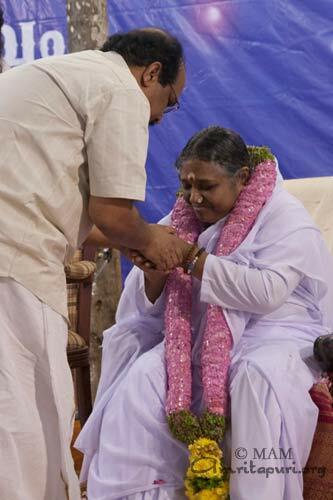 She gave the example of Tamil Nadu, the neighbour state – which recieves only two good rainfalls every year- yet it produces such good crops. 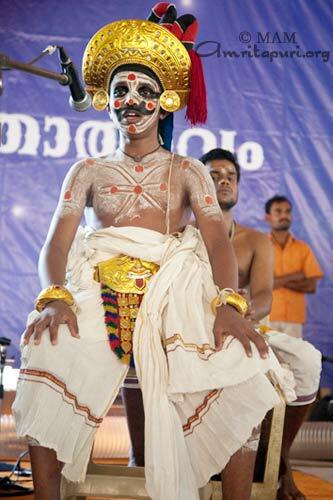 In Kerala- which recieves a downpour, agriculture is dying. 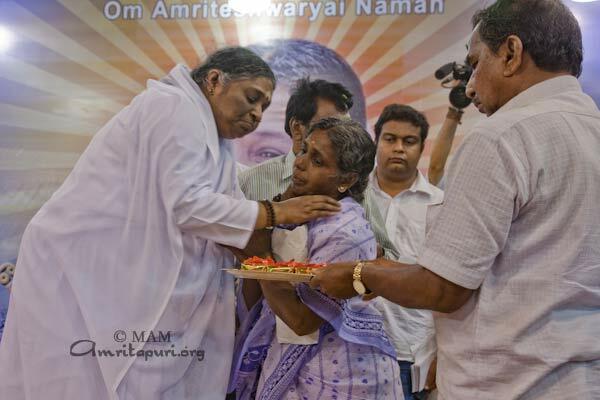 “Agriculture is life itself, Amma feels sad that it is being lost now. 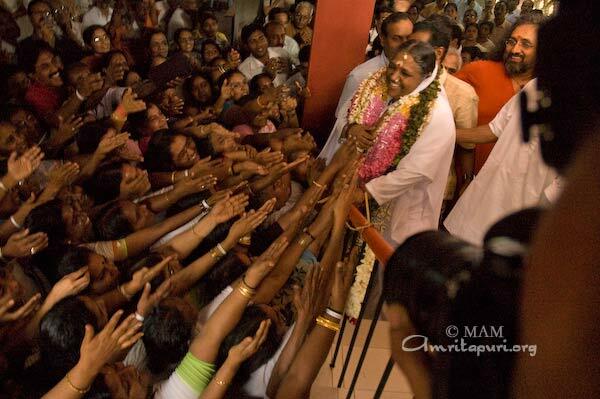 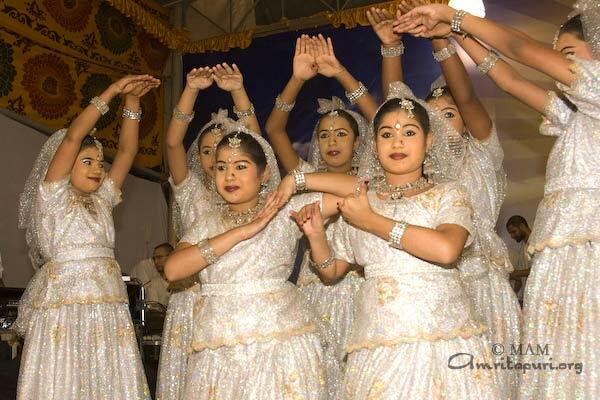 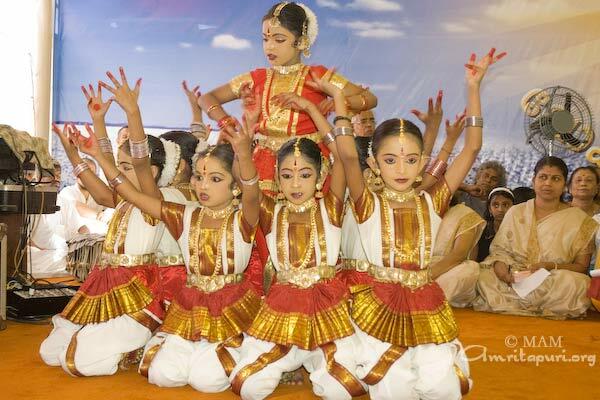 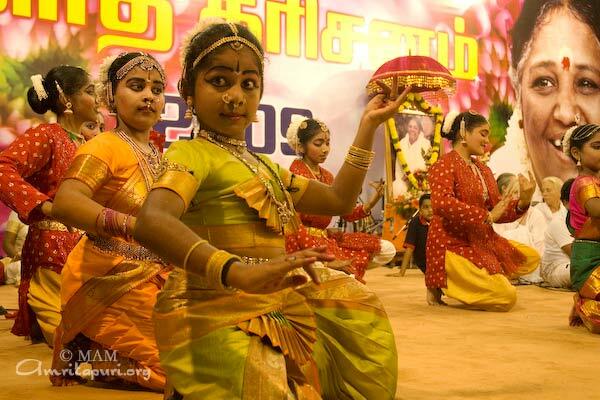 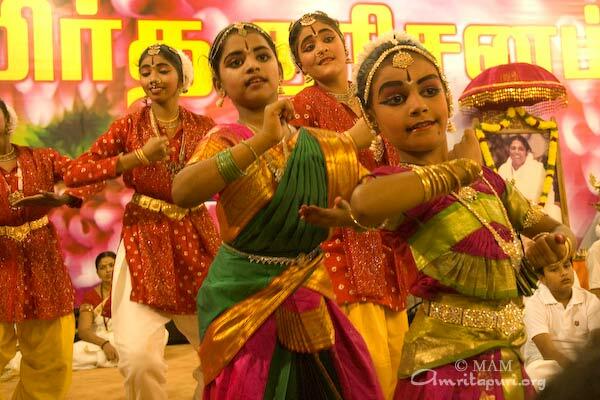 But, upon seeing the enthusiasm of my children, Amma feels confident that it will not die out”. 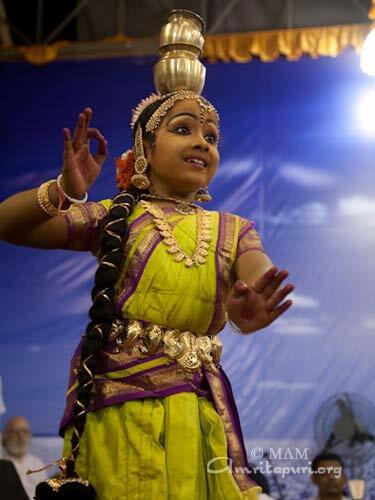 She told about her plans to undertake crop rotation in that same tract of land – with plantations of rice, mustard and vegetables to be grown every year. 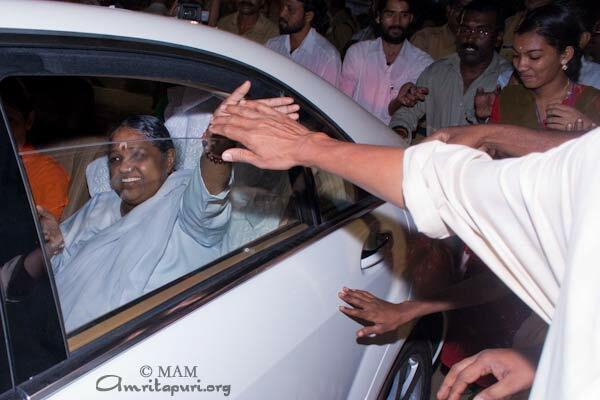 Seeing the attention of the students, Amma continued. 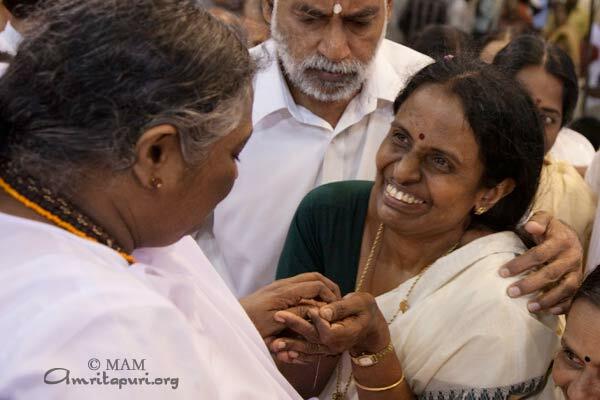 Amma recounted her childhood days when she was scolded by her grandmother for threshing the grains with her feet. 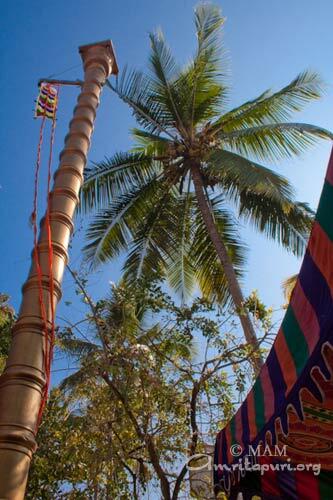 Usually for threshing they will tie a pole above the head, holding on to the pole, they would thresh the grains. 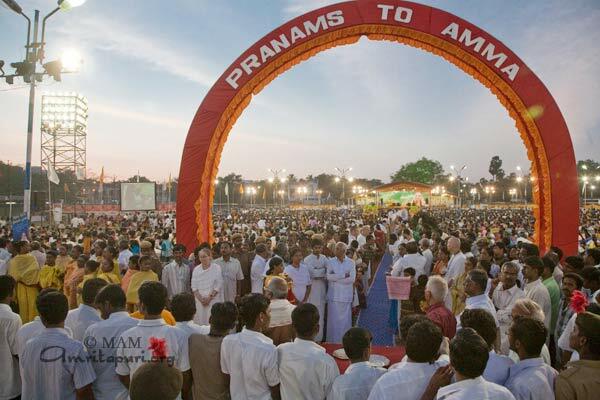 Amma explained how the threshing was done in those days. 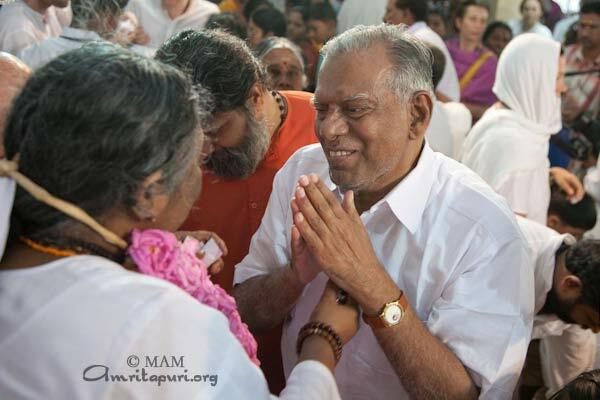 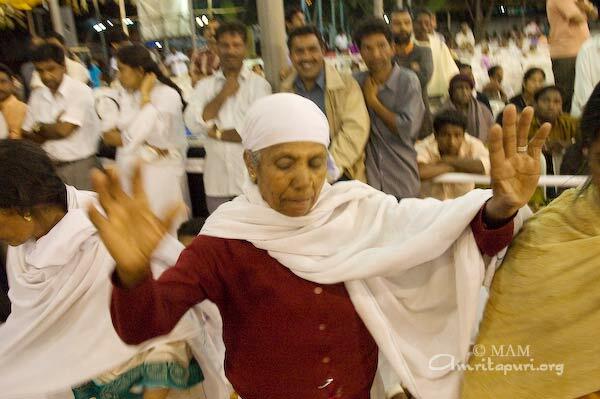 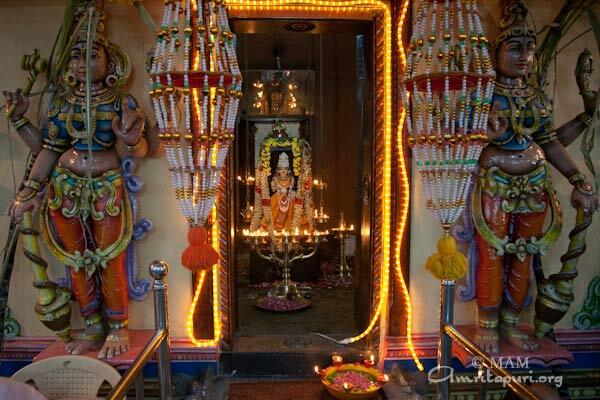 “In her grandmother’s house, Amma was assigned the task of protecting the grains that were being dried in the sun. 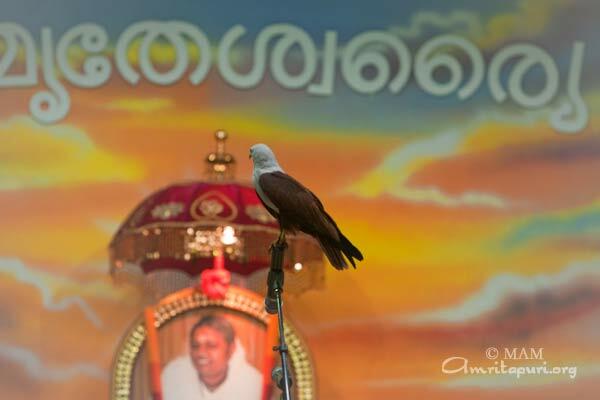 The predators were birds such as parrots and pigeons. 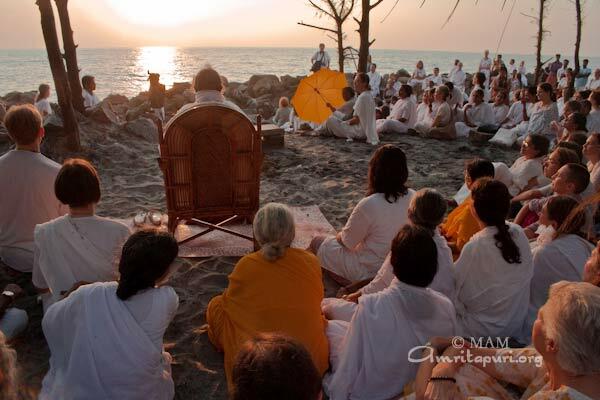 Amma loved Nature and solitude so much that she would continuously be singing all along as she stood watch over the grains. 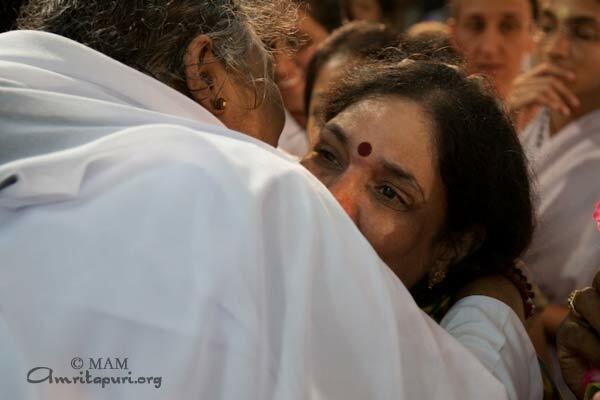 Though she had a slingshot with her to chase away the birds – she never used it against those birds, but loved watching them eat it,” Amma was recollecting her memories..
“Even today while traveling on the road, when Amma sees lush green fields her heart goes into rapture at the very sight of it as if it happens in bhakti. 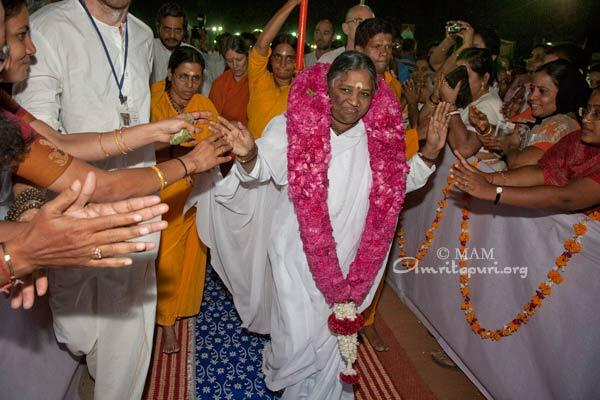 On a full moon night, as the ocean water surges up towards the moon, in the same manner Amma’s mind spontaneously surges out towards Nature. 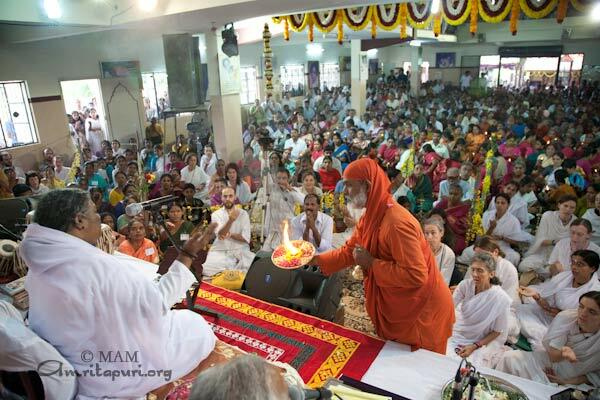 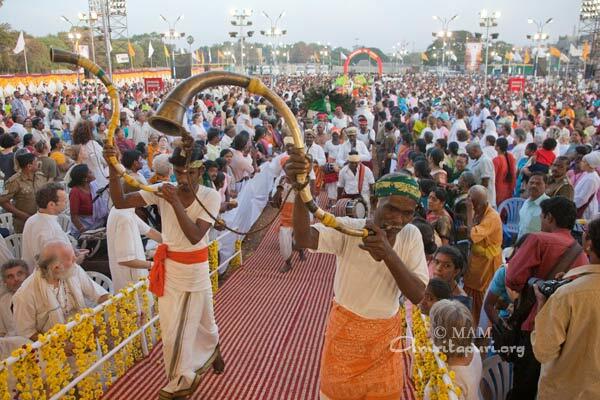 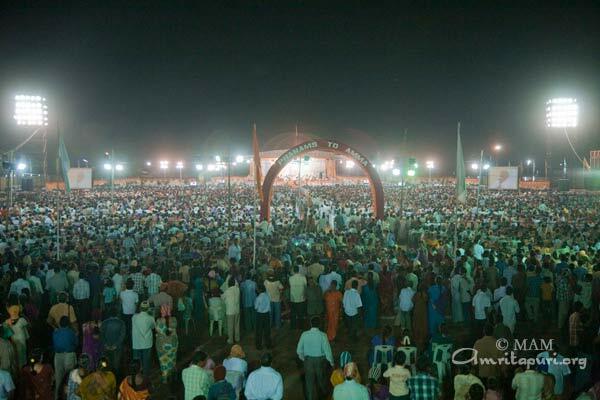 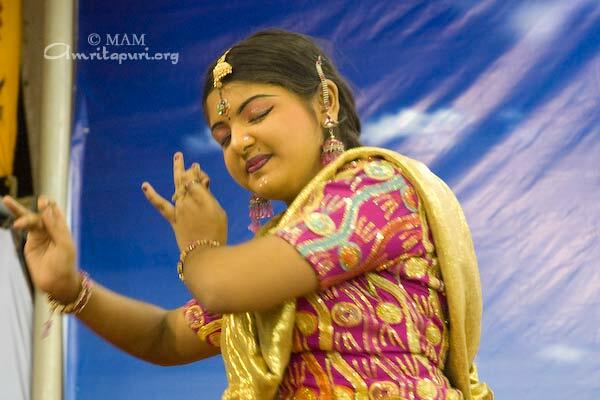 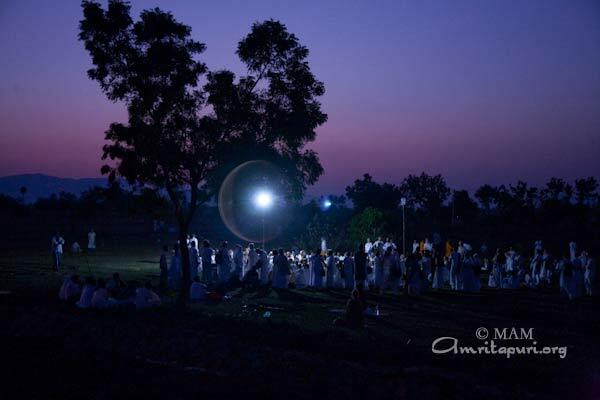 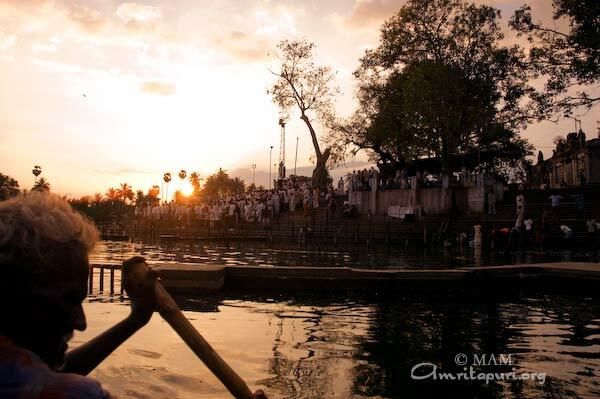 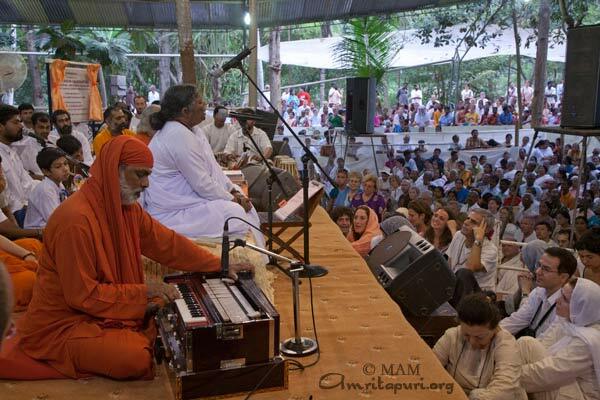 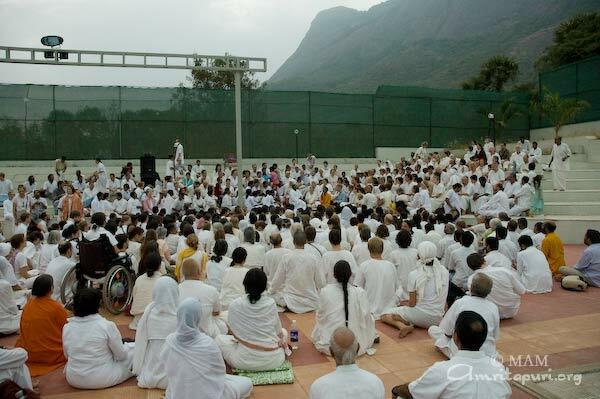 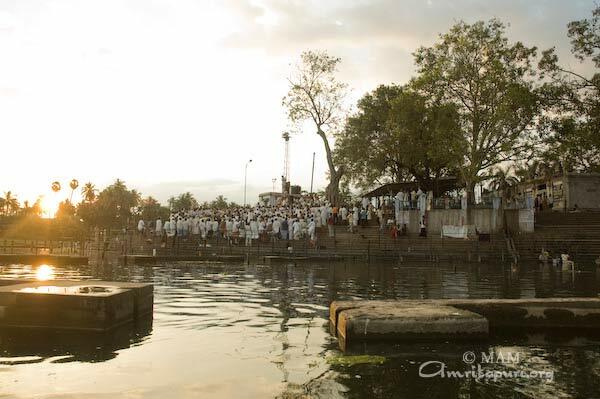 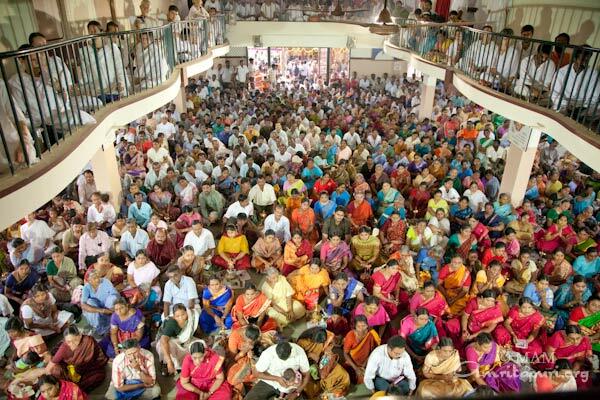 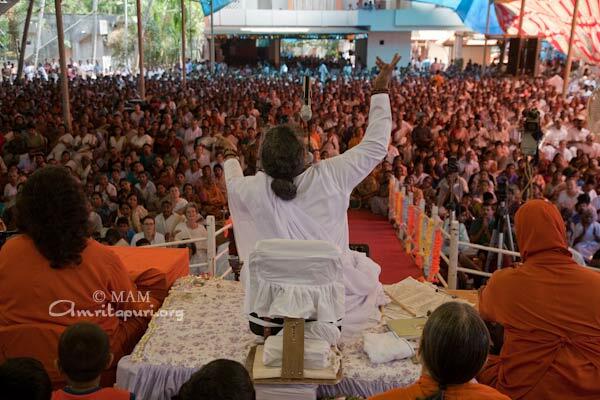 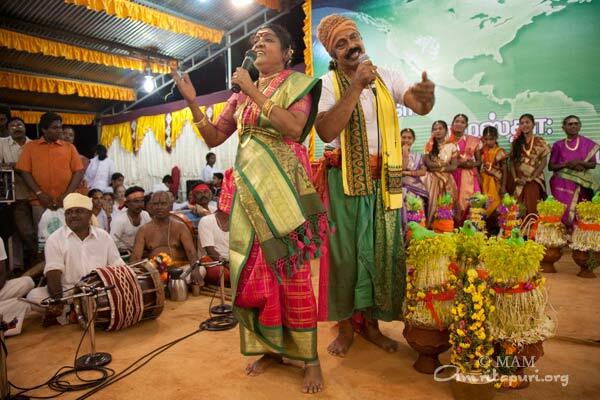 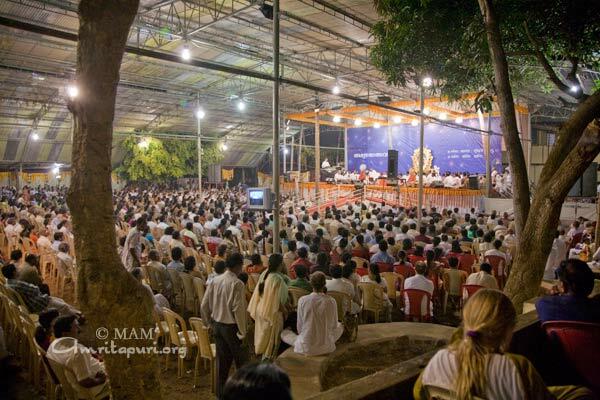 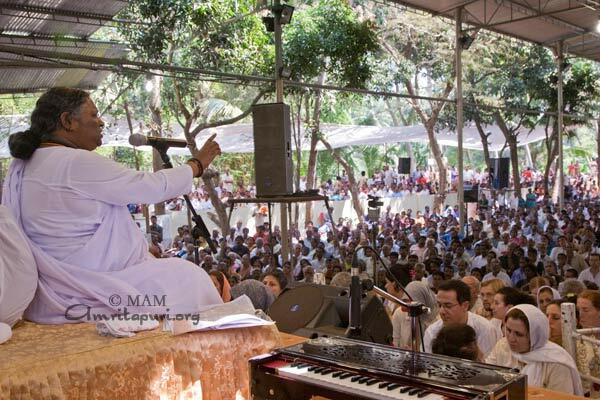 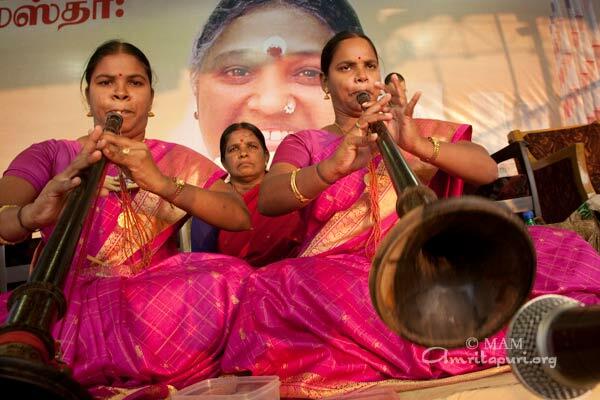 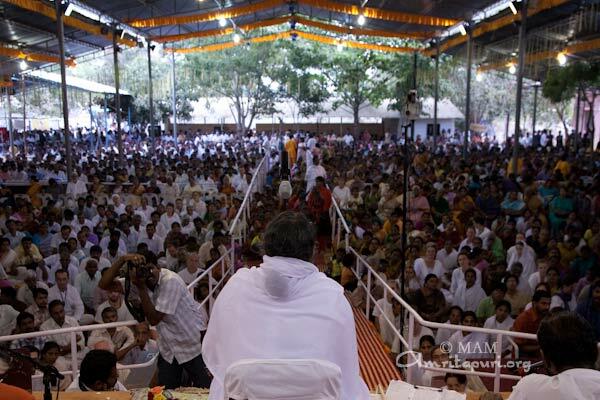 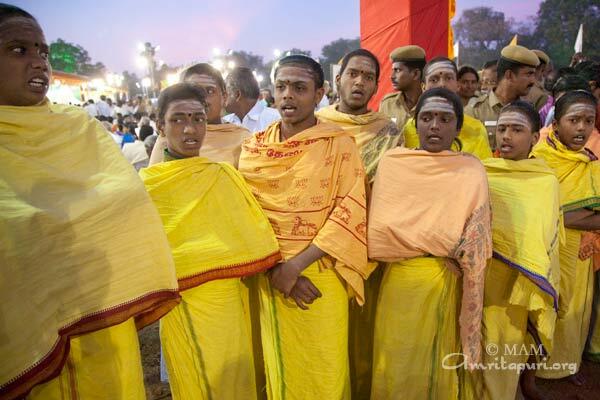 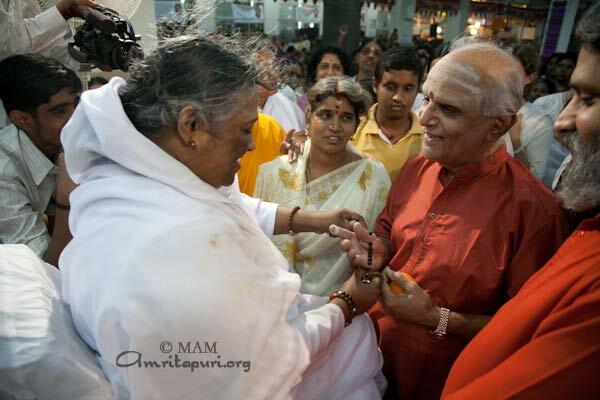 Amma continued, “The population is increasing alarmingly and there are fewer trees around. 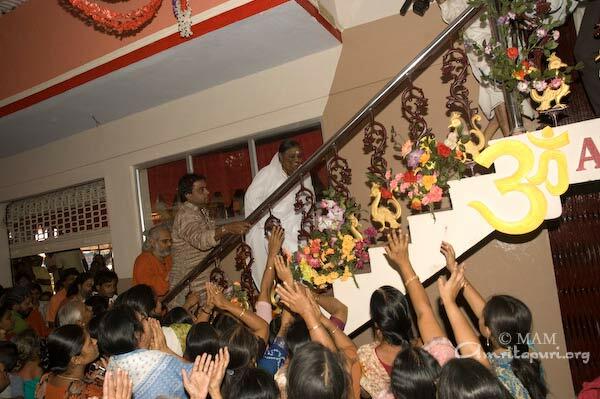 In these modern times, crows have to build their nest using plastics and steel twines as they do not have access to enough twigs from the scarce trees. 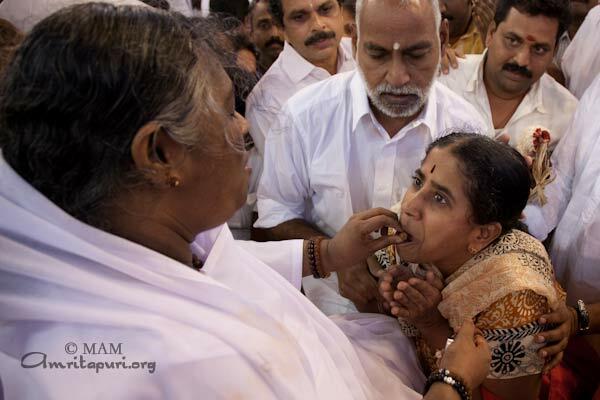 Today, the use of pesticides and chemicals to enhance the appearance of the food products has become widely prevalent – for some it might even be the only solution to alleviate poverty.” As she was narrating this, she started scratching her arm (the after effect of working in the straw, the fine dust particle of the straw mix with the sweat of the body, so you start itching). 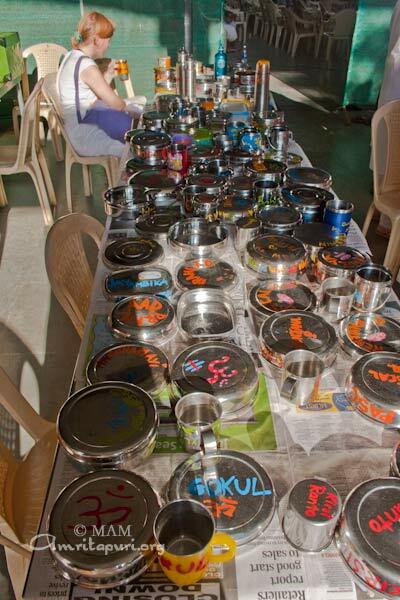 She advised the students to utilize any available space even on the terrace or the upper floors, to grow something. 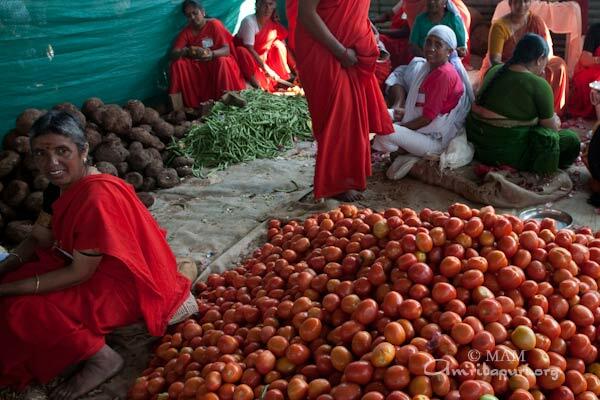 “Try to grow your own vegetables which are not loaded with harmful chemicals. 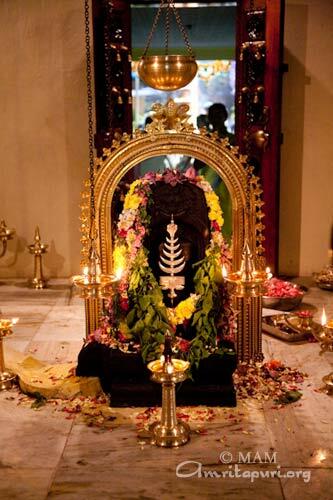 On many houses in Japan, though they might be small, they still grow flowers and vegetables by hanging pots all around.” She counseled them to bring back the culture of cultivation and attain self sufficiency as far as possible by putting aside at least one hour every day for this purpose. 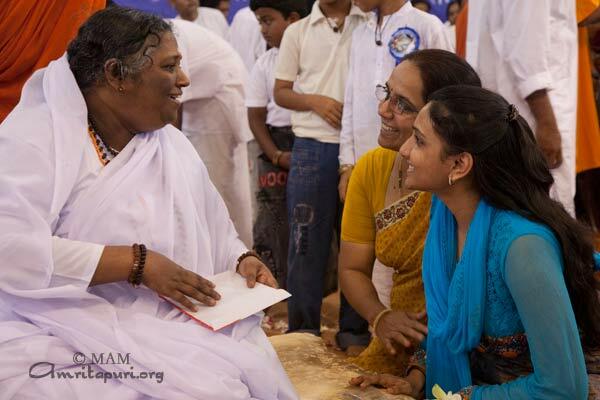 She noted that the youth in the west are very aware of these problems and are really sincere about bringing about a positive change in the situation. 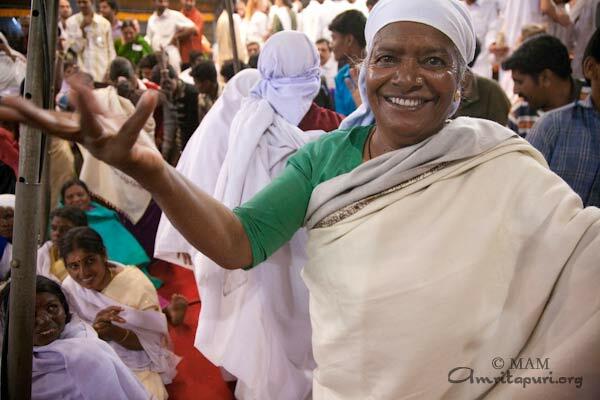 In France, they usually used feathers to insulate the walls to protect themselves from the cold. 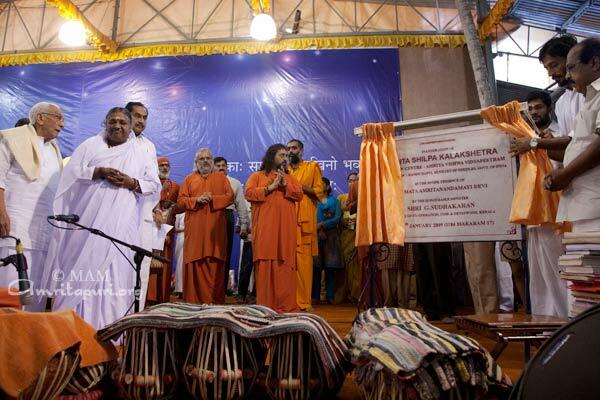 AYUDH (Amrita Yuva Dharmadhara – the Youth wing of MAM) in Germany tried out a similar construction using hay – which is much cheaper, available and practical. 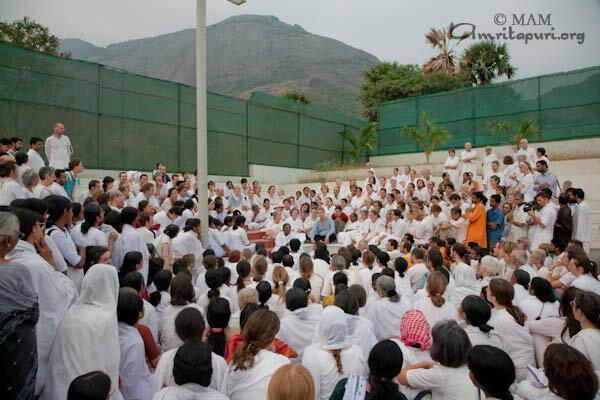 In Amma’s French Ashram they also make walls that contain beehives. 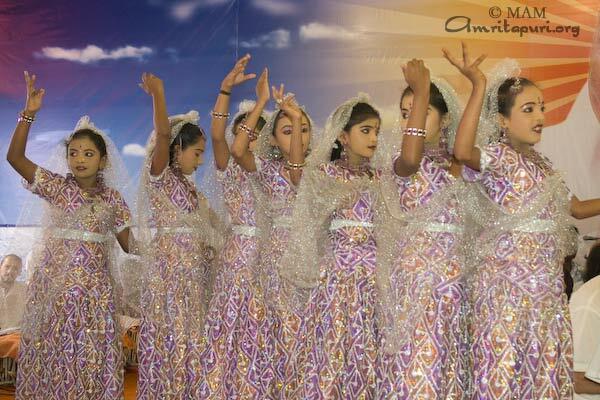 The beehives act as natural heating for the house during winter – maintaining the internal temperature at around 21 degrees Centigrade. 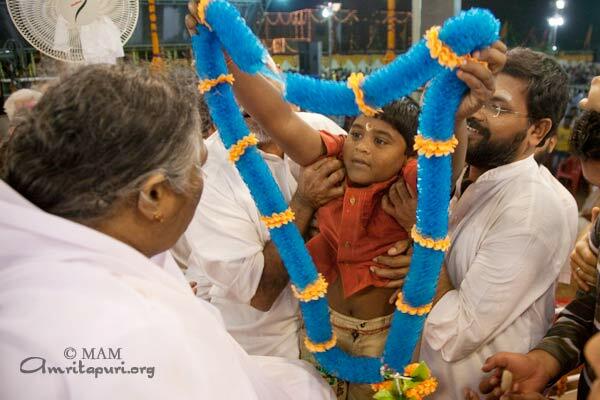 The youth there are so sincere about this. 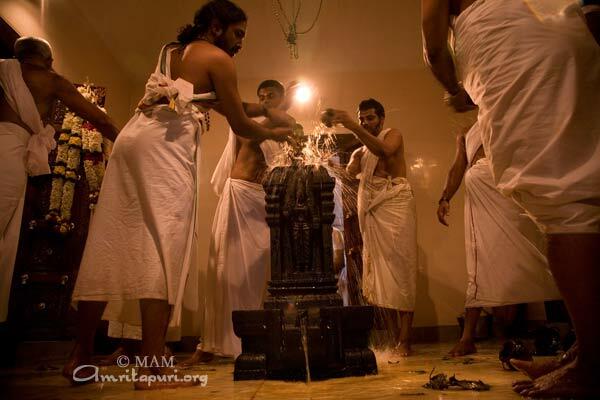 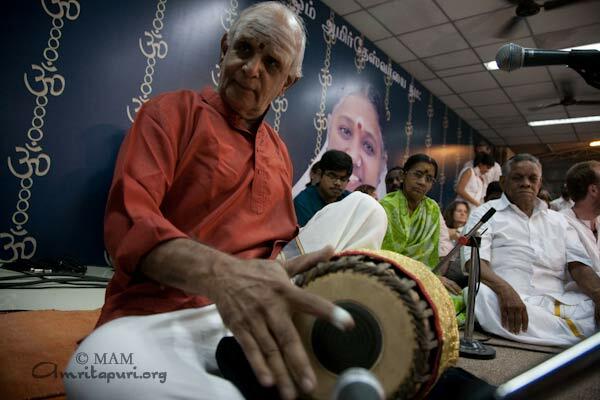 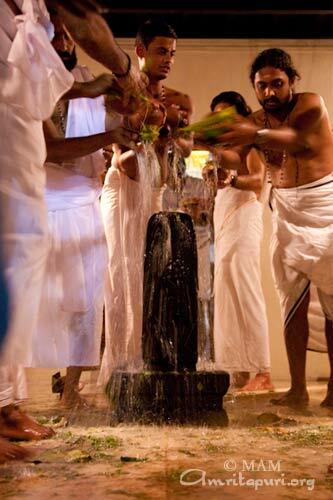 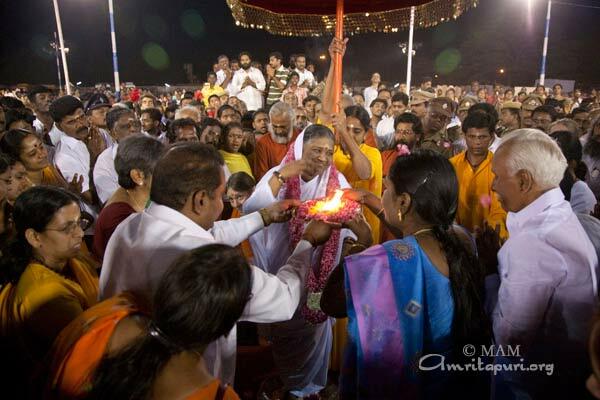 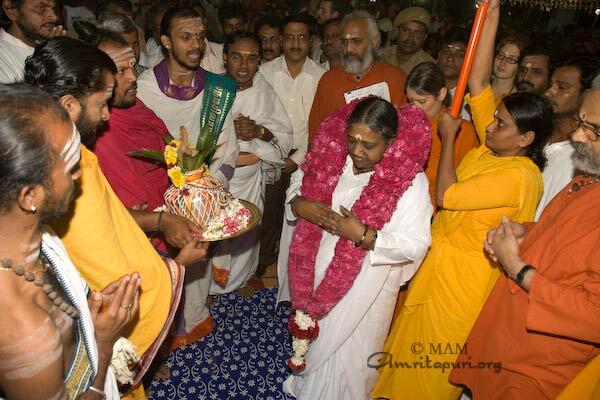 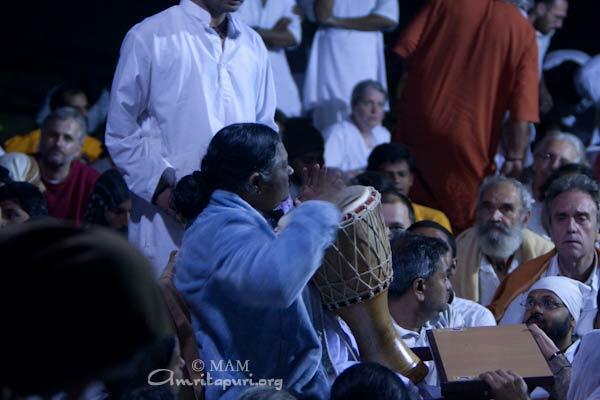 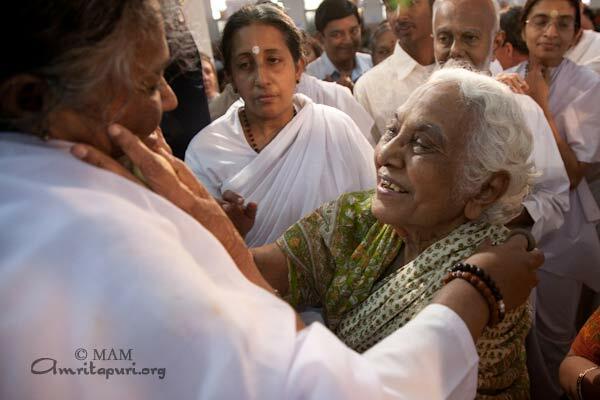 Once Amma expresses an idea, they immediately pick it up and implement it within a short time. 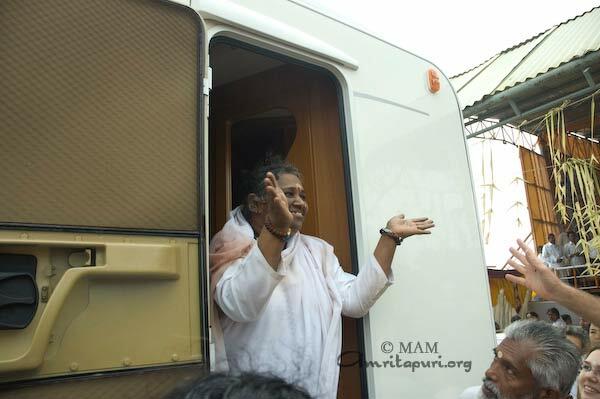 During one tour stop of Amma’s last Europe tour Amma had talked about setting up apiaries and harvesting honey. 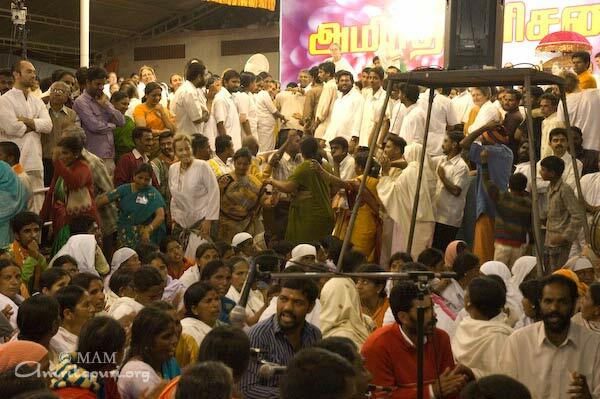 By the end of the tour when Amma visited that country again the youth already brought some honey to Amma from the hives they had put up! 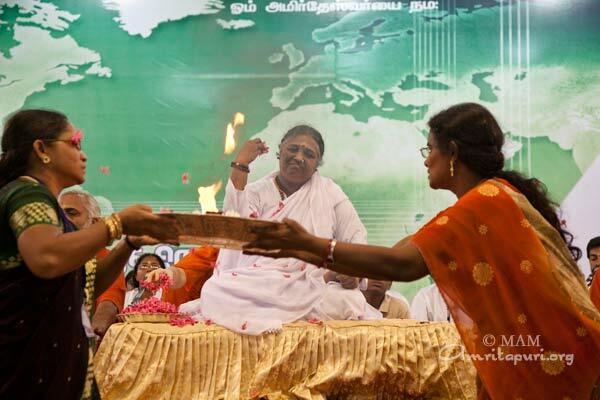 Amma rhetorically asked if agriculture was not our life? 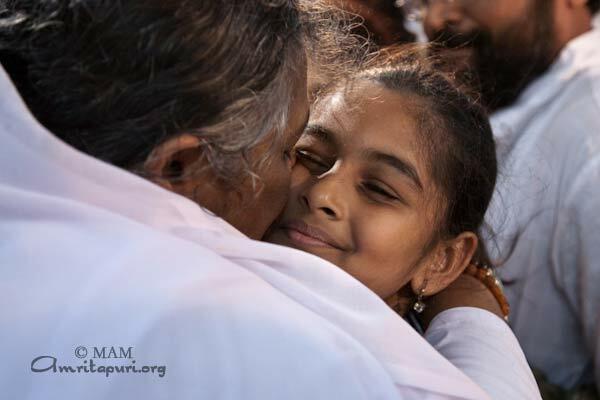 How can we survive without it? 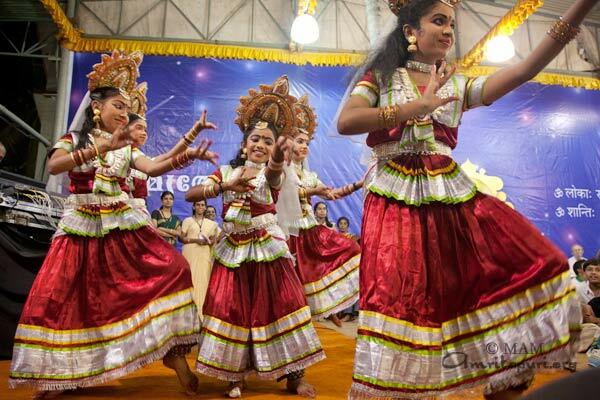 She exalted the mothers who give this samskara (culture) at an early age to their children because it would be good for all concerned. 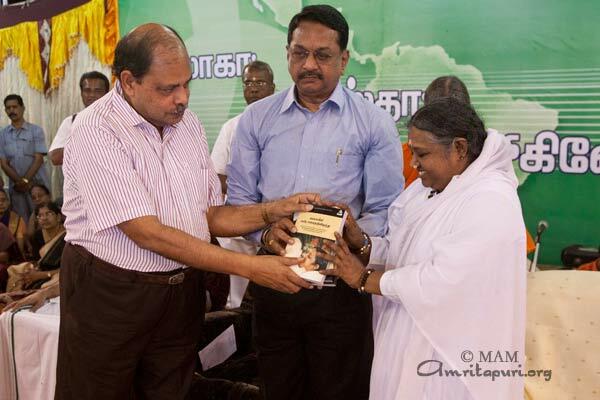 Amma said she had received this in her house. 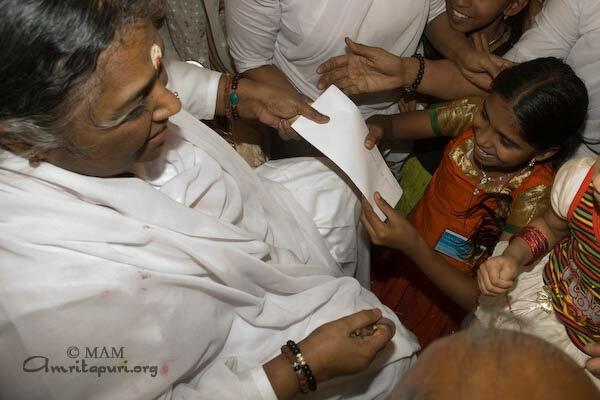 But the present generation…? 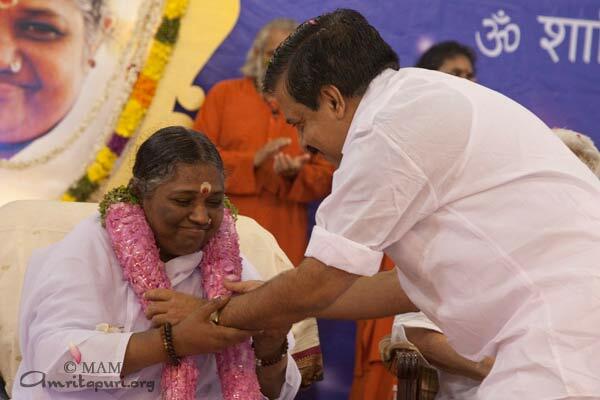 Amma is providing us with all the opportunities to develop the right attitude, do the right actions, at the right time. 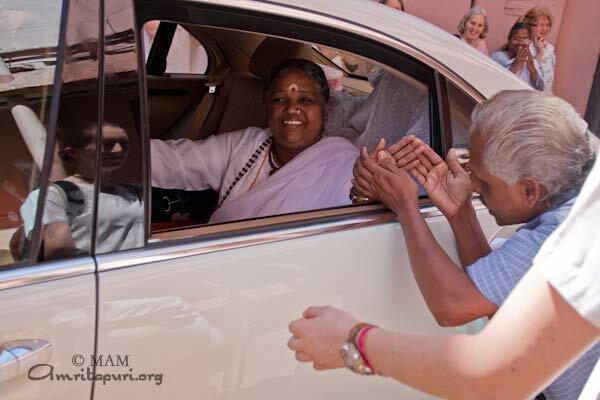 It is up to each one of us to make use of it – now. 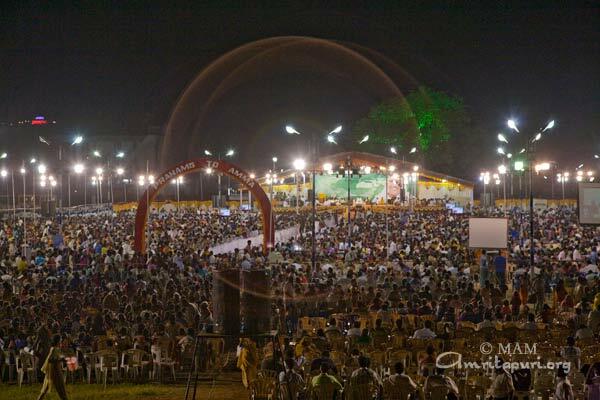 Inspired by Amma’s message of ‘love and serve’, the students of Amrita University have been dedicating time to raise money for the poor. 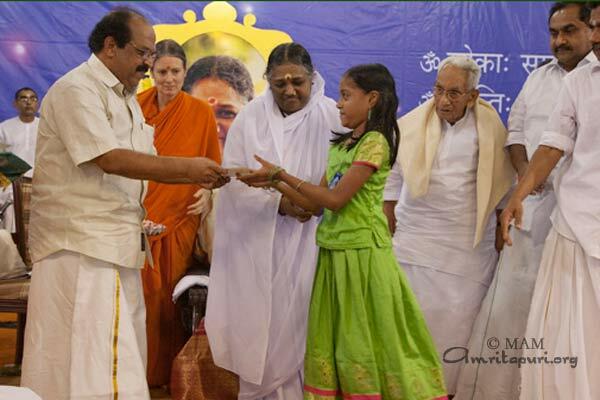 Under the leadership of Muhammad Ashik (ME), Balu Menon (CS), Nirmal (BBM), Bimal (BSc) and many others, they raised Rs. 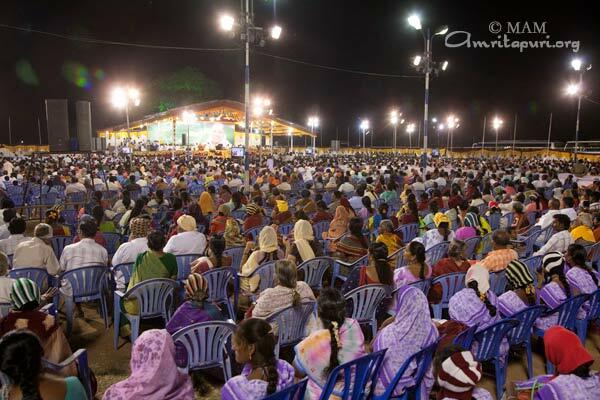 24,000 by selling North Indian snacks, painting temporary henna tattoos and selling gift items on the Amritapuri campus during the Diwali festival. 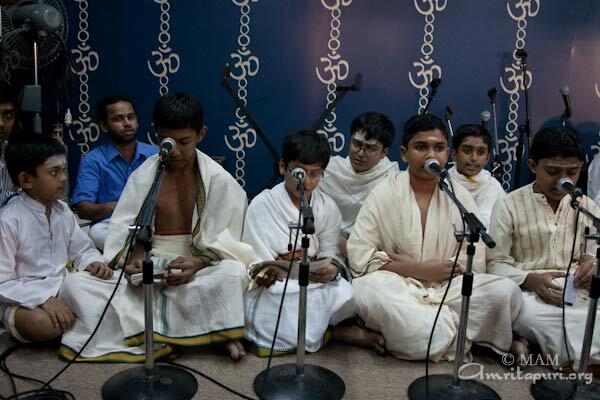 The students presented Rs. 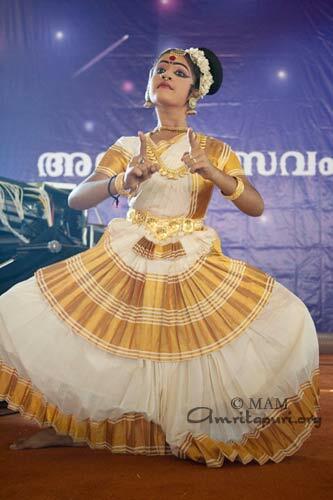 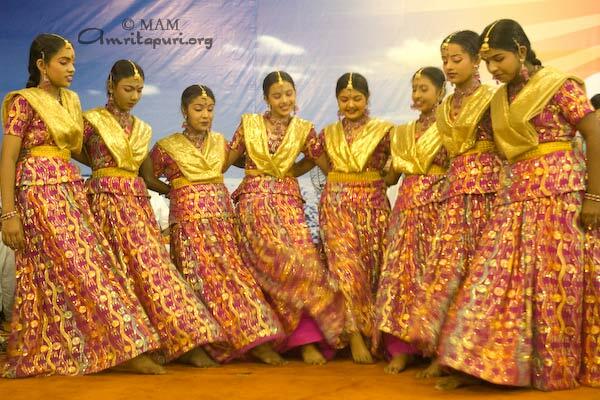 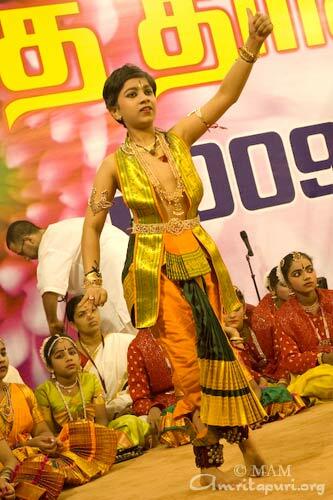 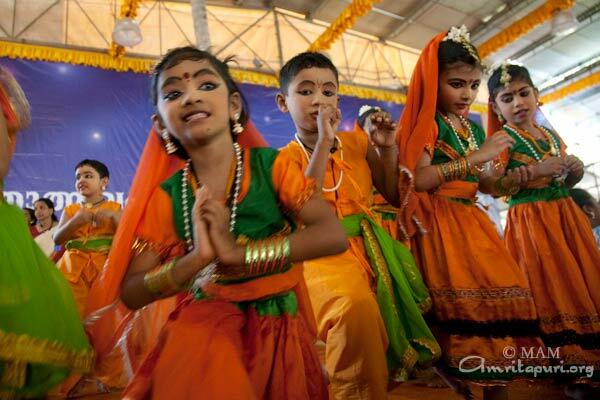 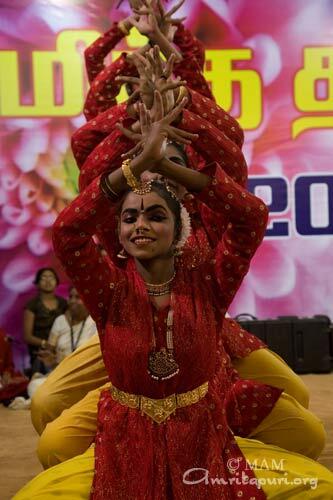 12,000 of the money raised, to sponsor the education of a Ramya (6th standard) at the Ashram’s orphanage in Parippalli. 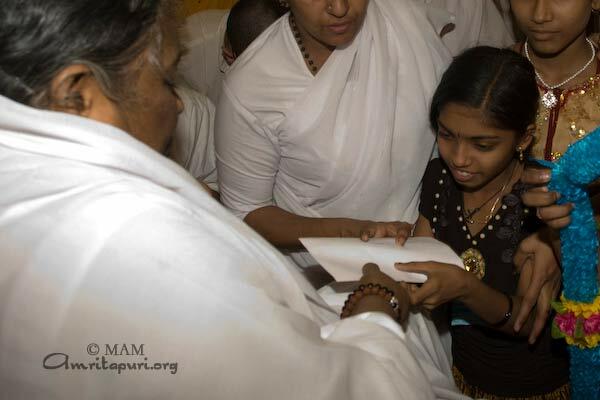 This money is being put in a savings account in Ramya’s name. 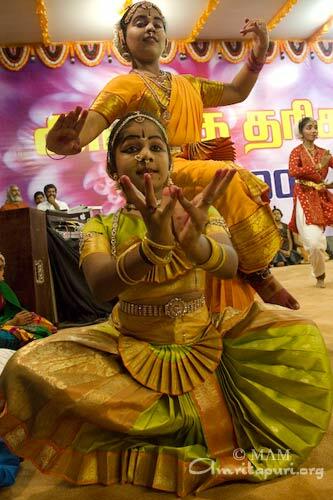 Her father, who worked climbing trees to harvest coconuts, fell down and died while working. 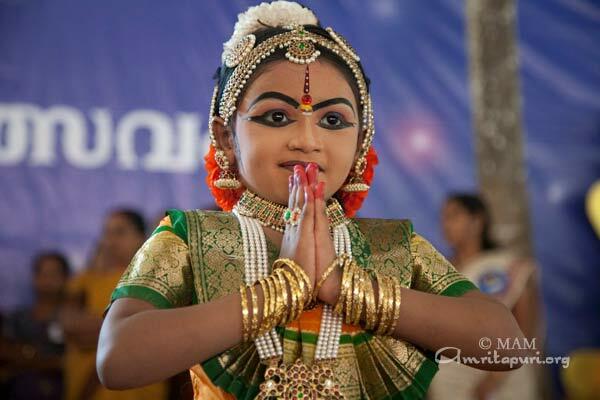 Ramya is a bright student who says she wants to be a science teacher when she finishes her education. 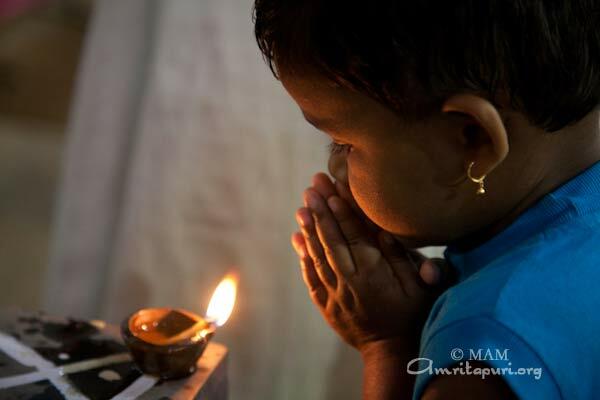 The remaining money has been given to sponsor a surgery at AIMS Hospital of a one and half old child named Mahendra, who has been diagnosed as having a hole in his heart. 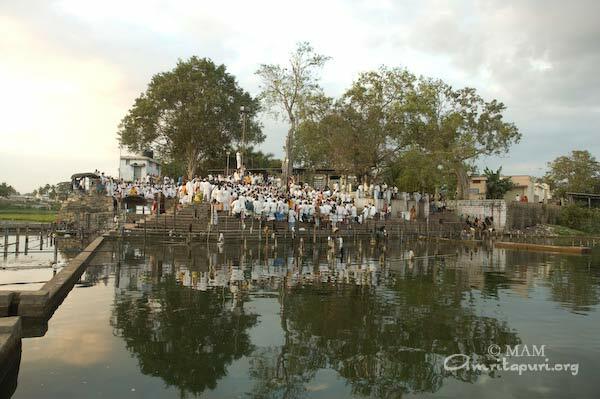 First week of January 2009. 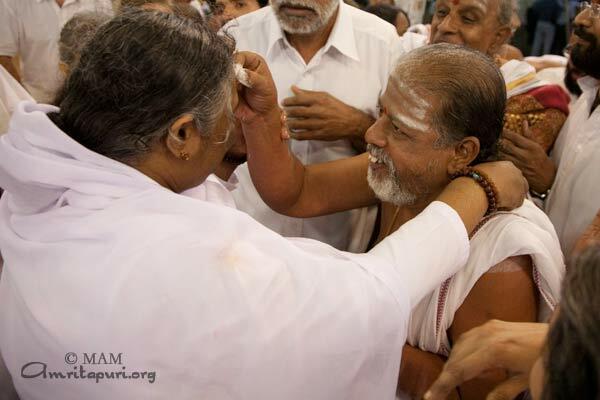 Photos of peace puja, tsunami twins, eagle, arati, Amma threshing the stalks, meditaion at the beach, preparing for the tour etc.